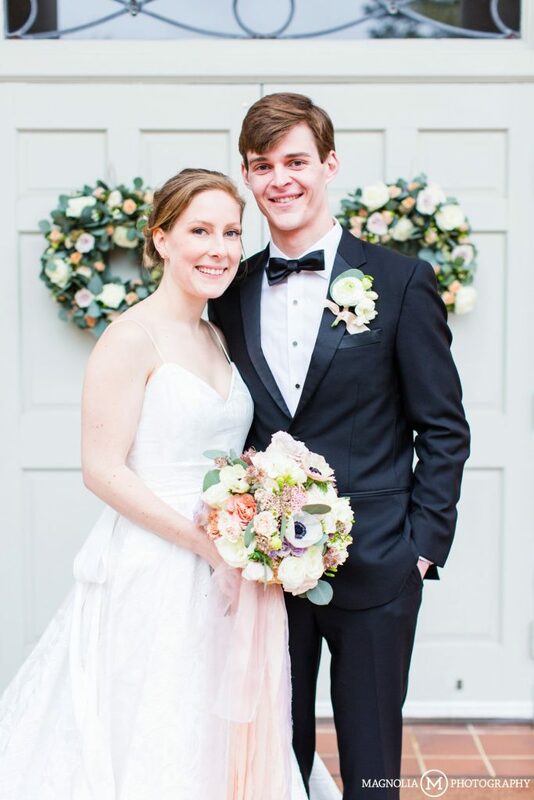 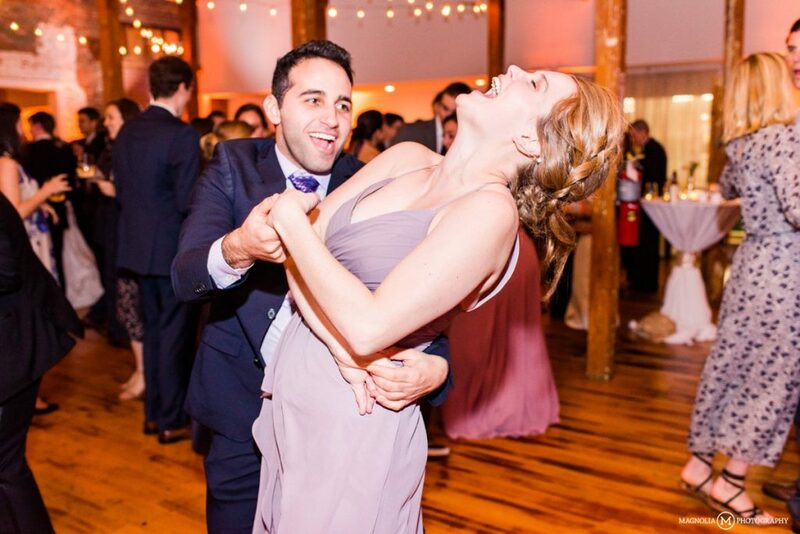 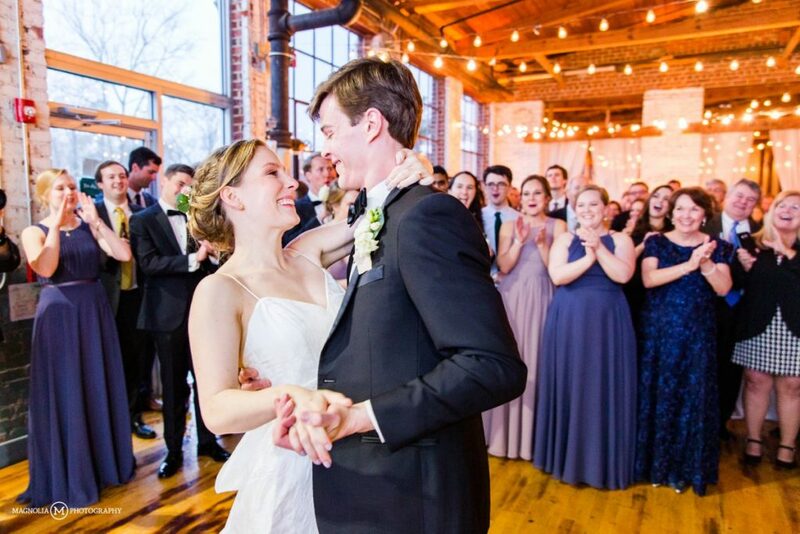 Before we get in to all things wedding for Kristin and Glenn, we’d like to congratulate the two of them on getting matched to Ohio State for their medical residencies! 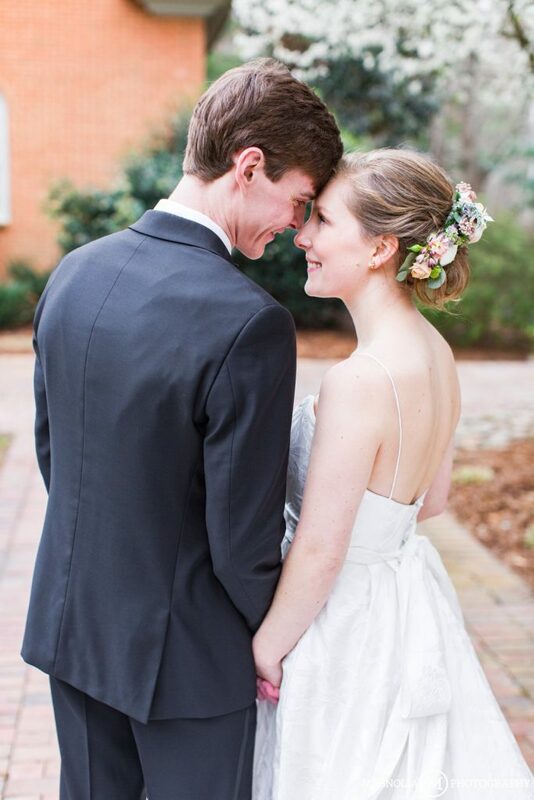 It will make their not warm, but not freezing wedding day seem like summer as they brave their first northern winter! 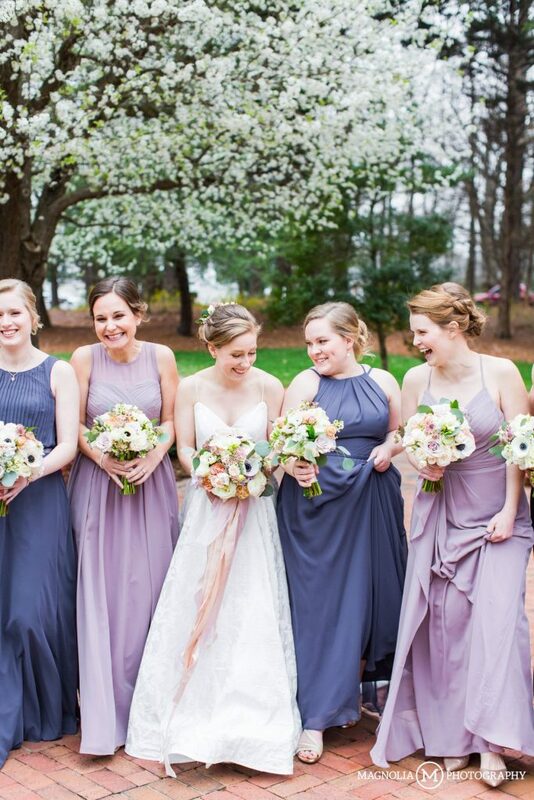 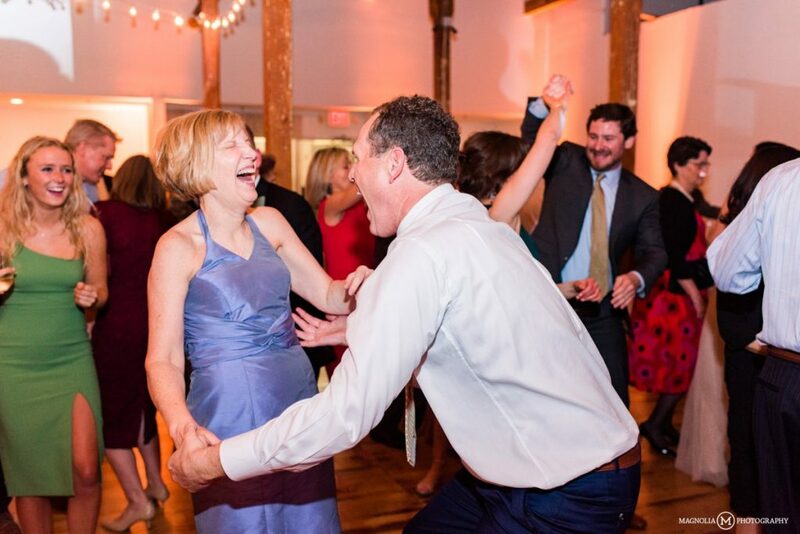 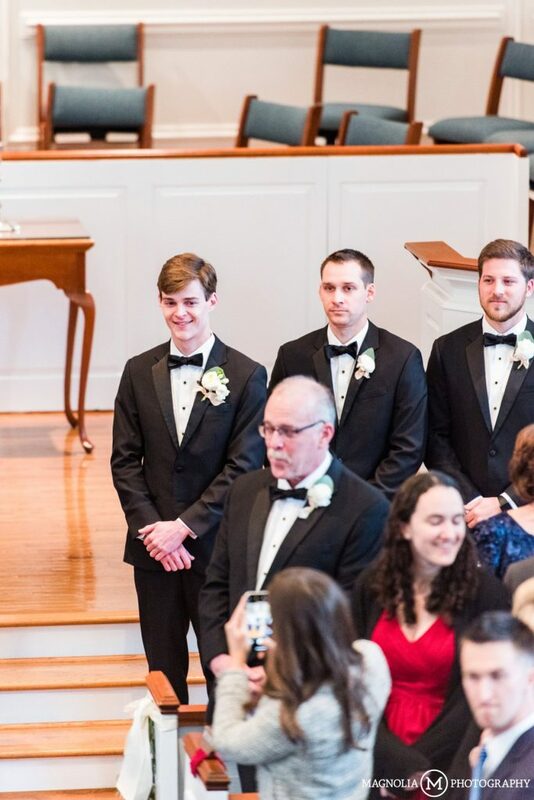 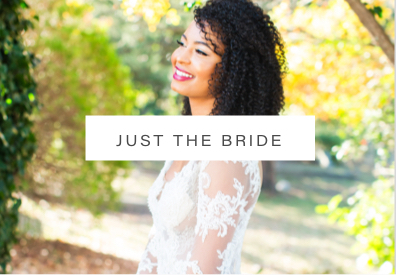 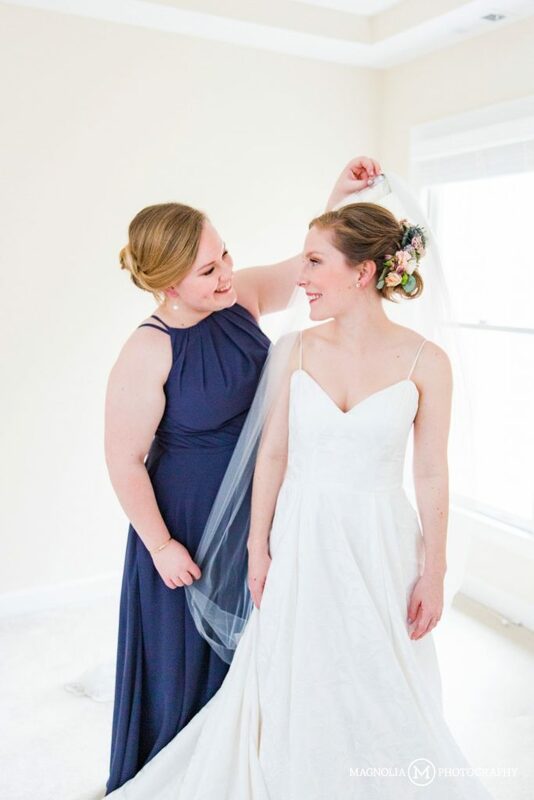 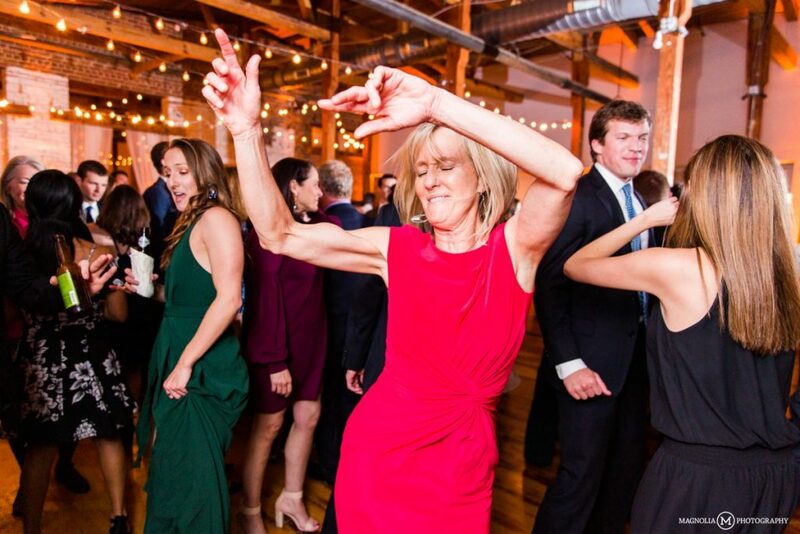 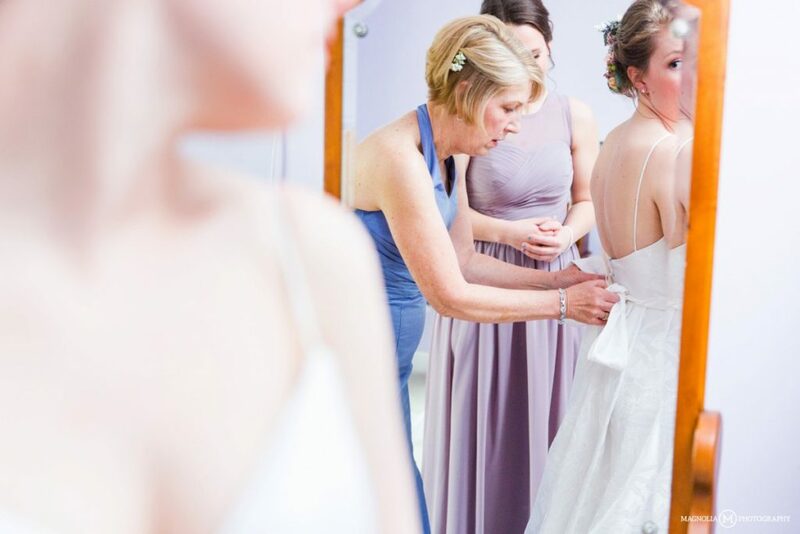 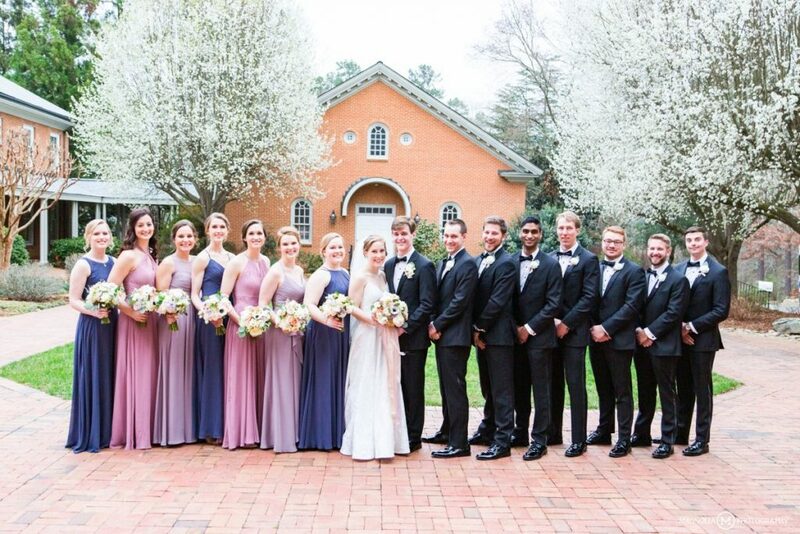 On a day with lots of traveling between Chapel Hill, Durham and Pittsboro for getting ready, ceremony and reception locations, there were lots of chances for the strategically planned timeline to go awry. 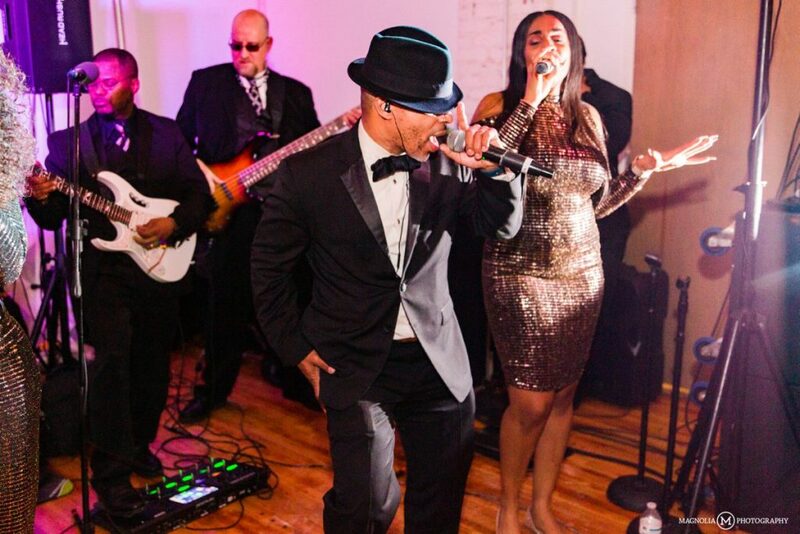 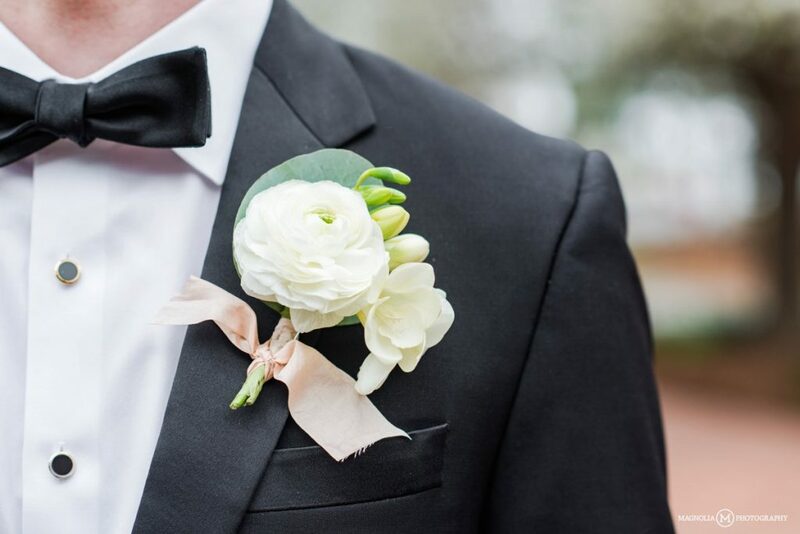 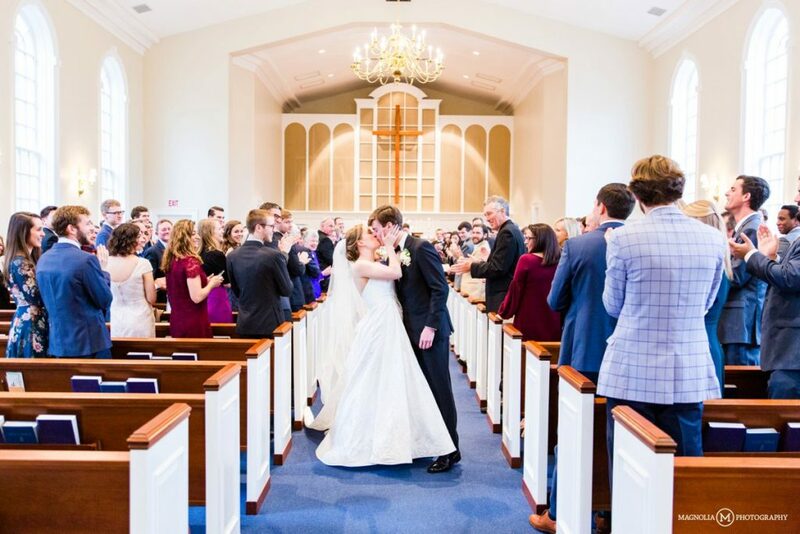 Kristin and Glenn, their friends and family and all of their wonderful and talented vendors pulled off the entire day without one single hitch – on top of which was the final Chapel Hill basketball game of the regular season… versus Duke. 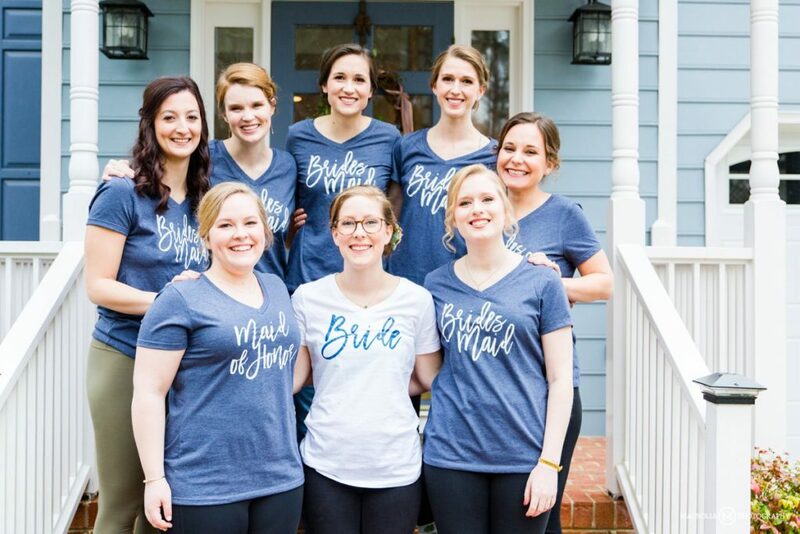 The ladies got ready at Kristin’s childhood home, toasting with champagne and sharing a few tears and hugs in memory of those who are no longer with us. 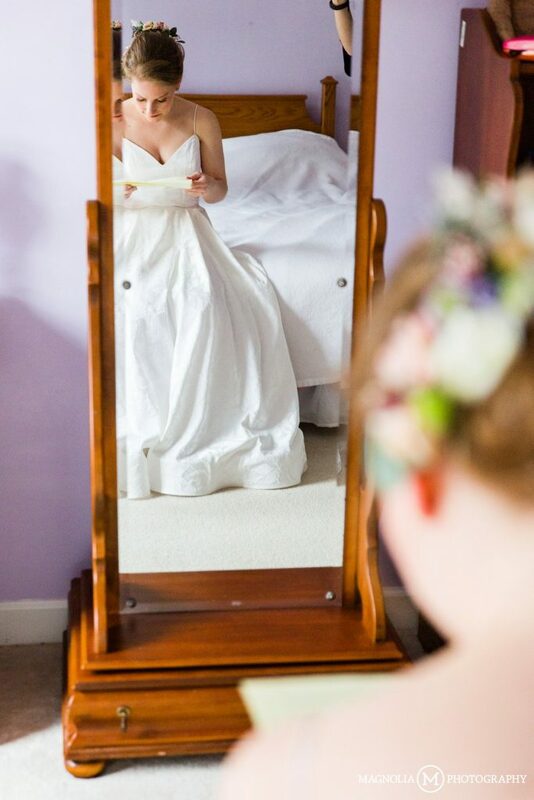 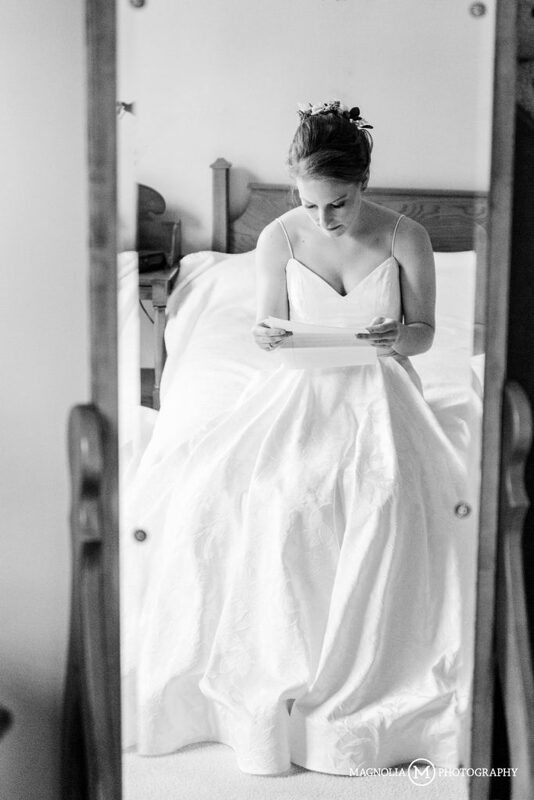 Kristin took a few minutes to herself and read a letter from Glenn in her bedroom which was painted perfectly to match the dusty purple she used as one of the wedding colors. 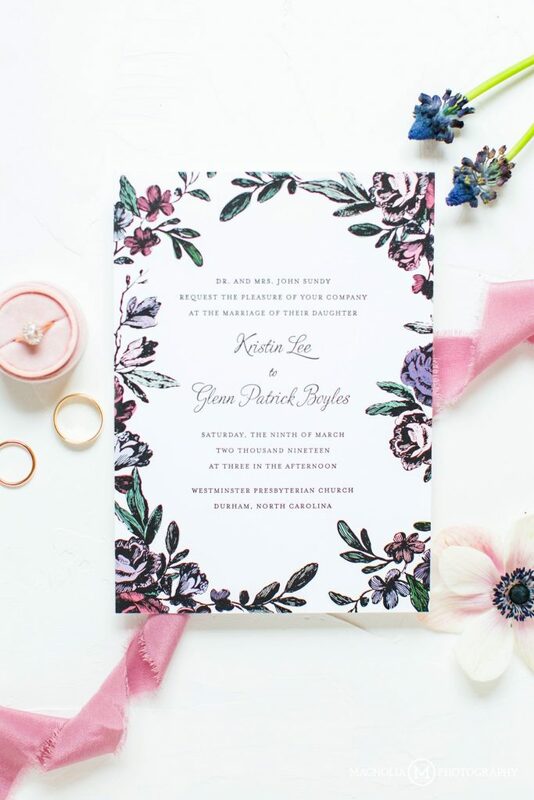 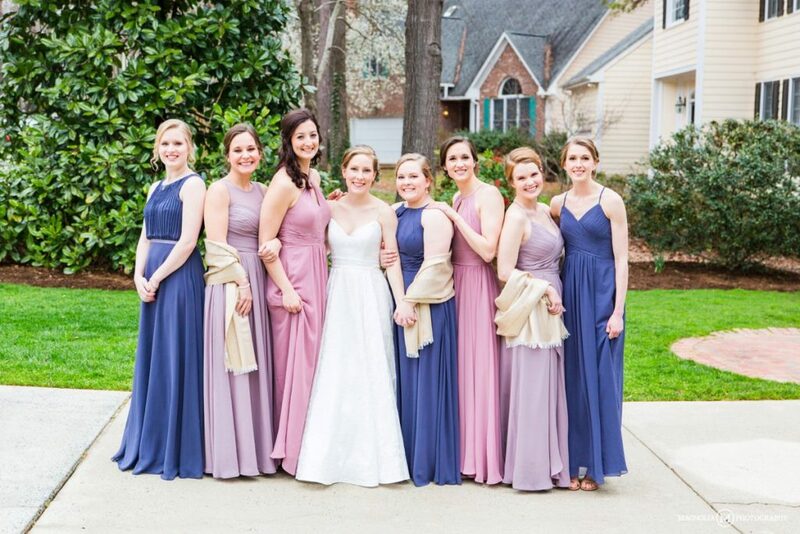 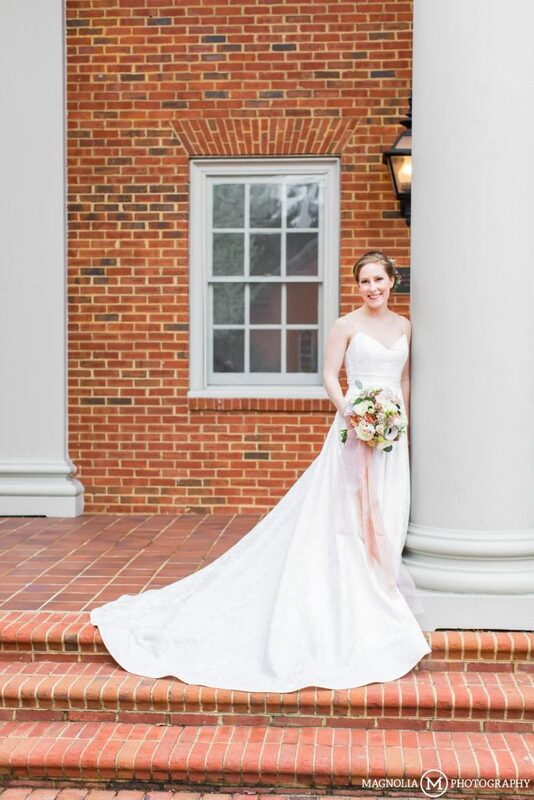 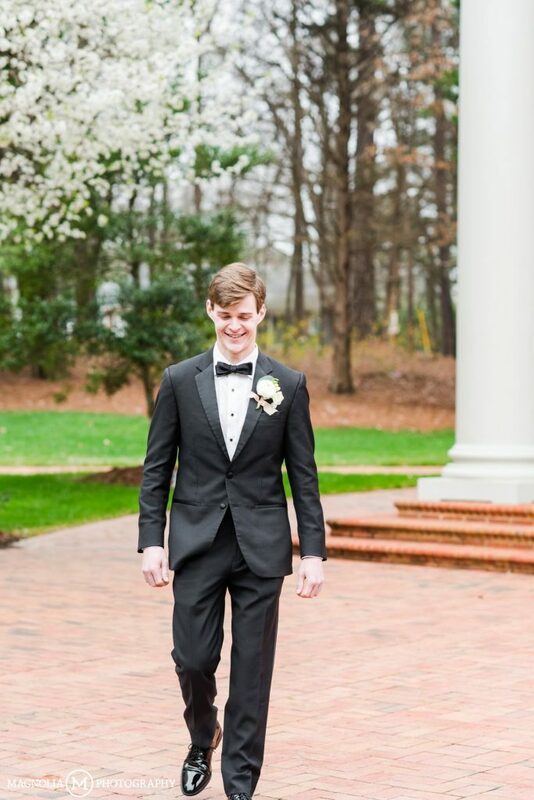 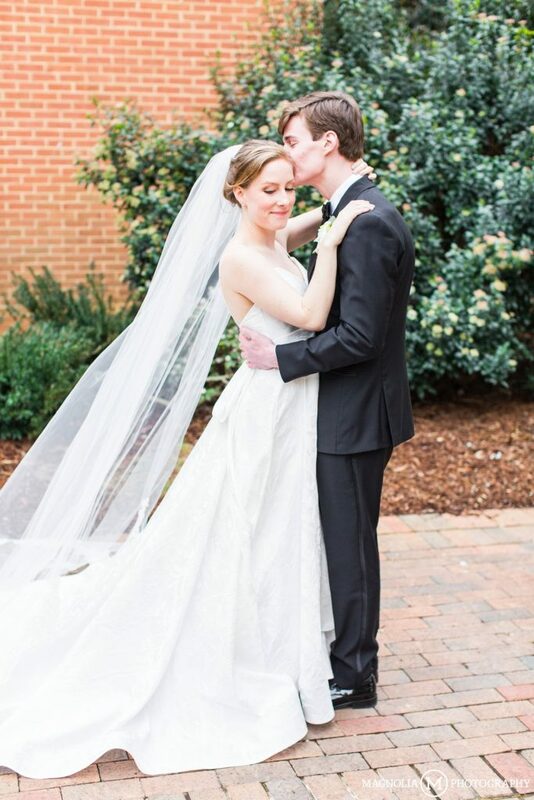 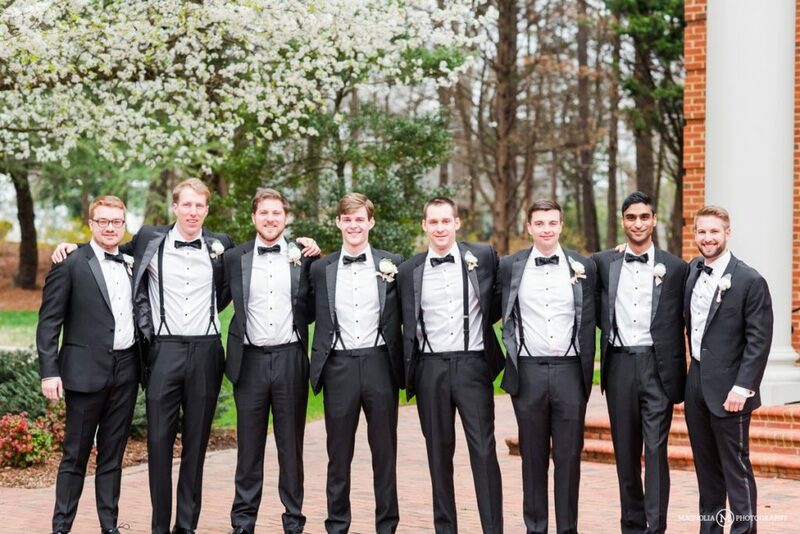 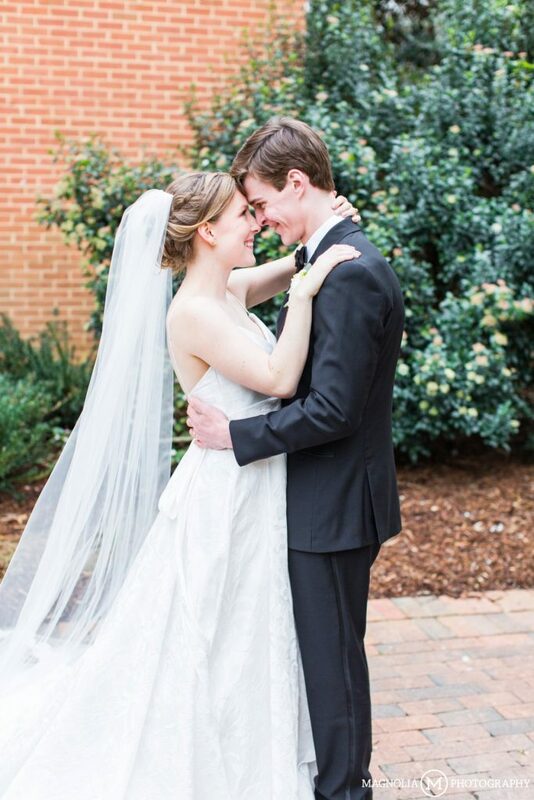 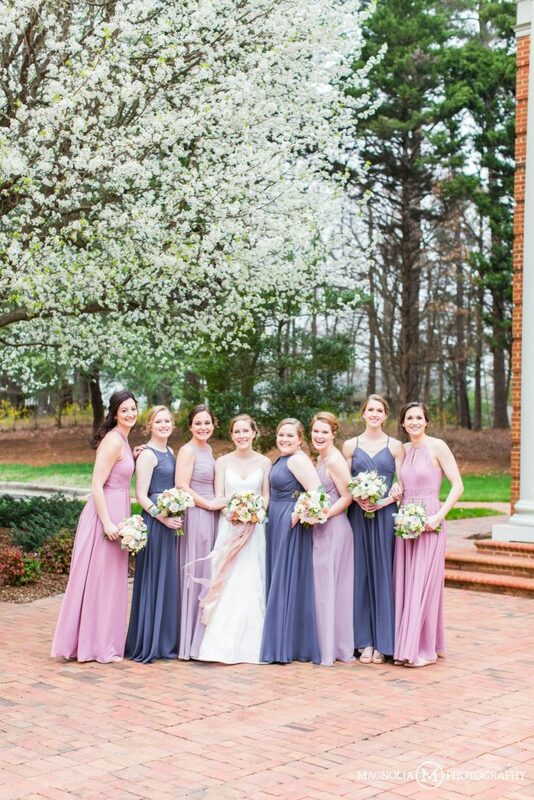 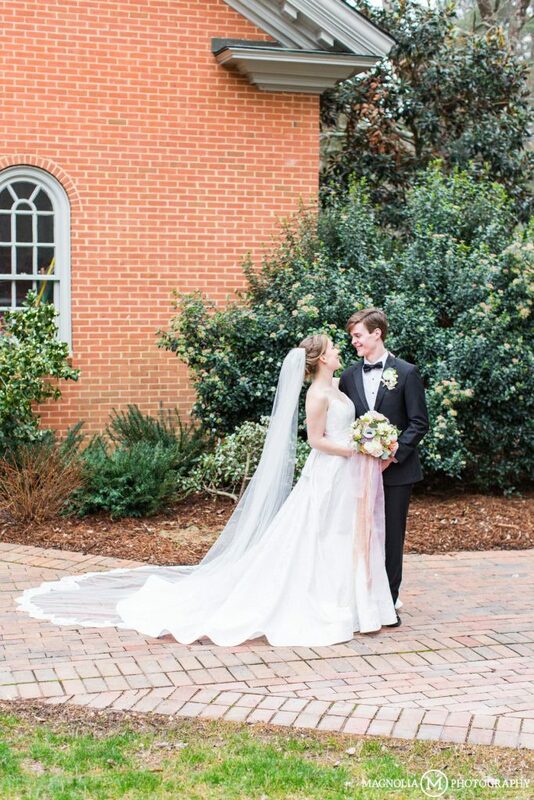 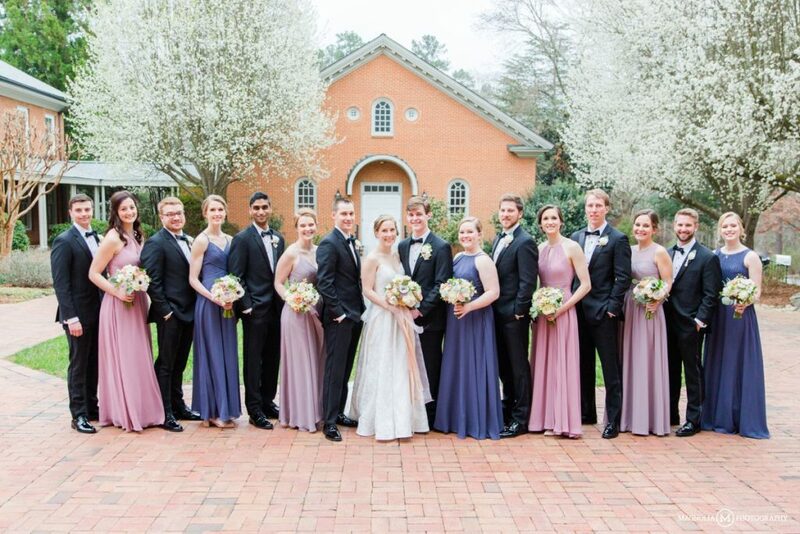 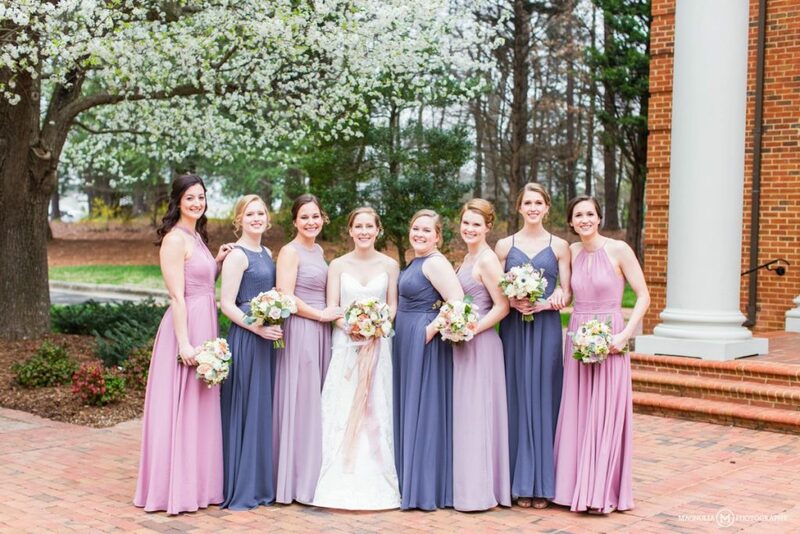 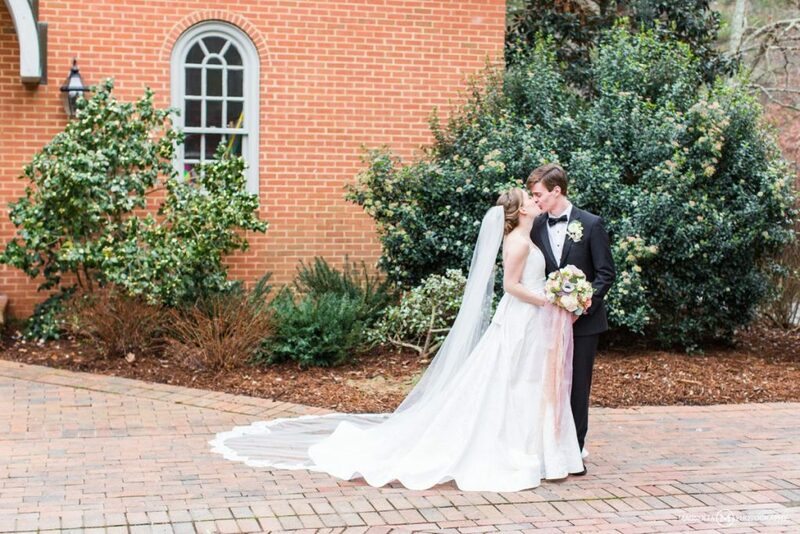 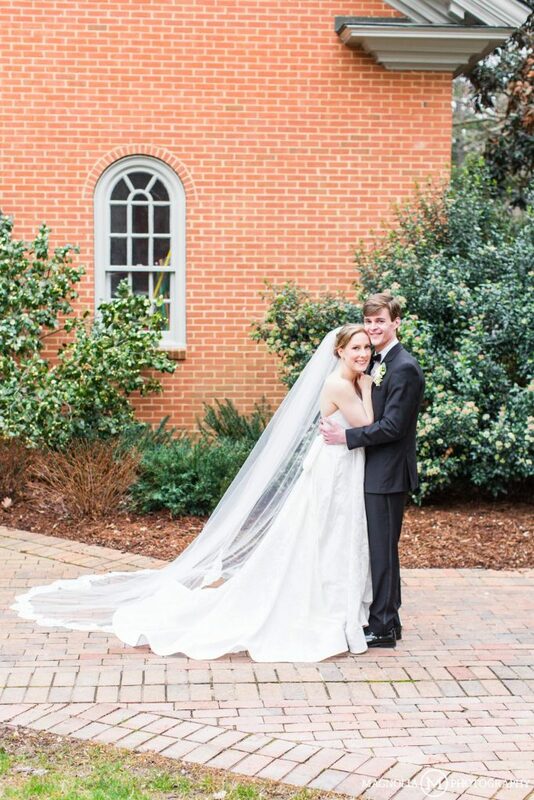 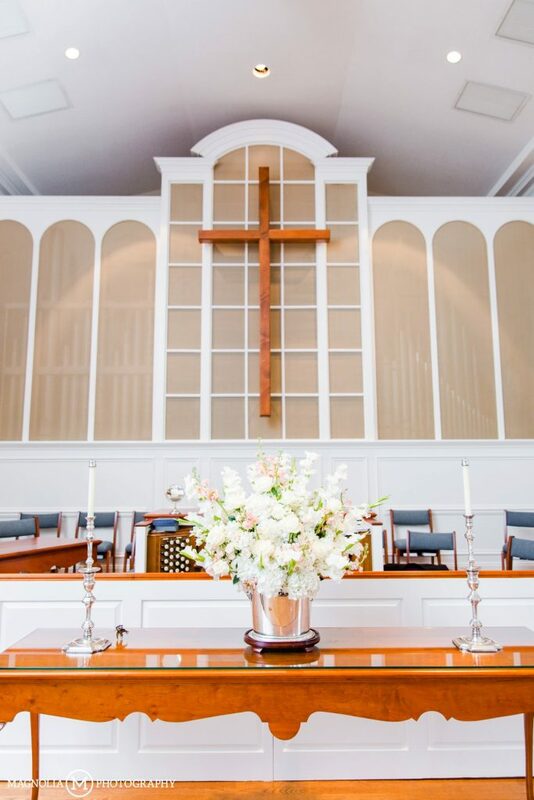 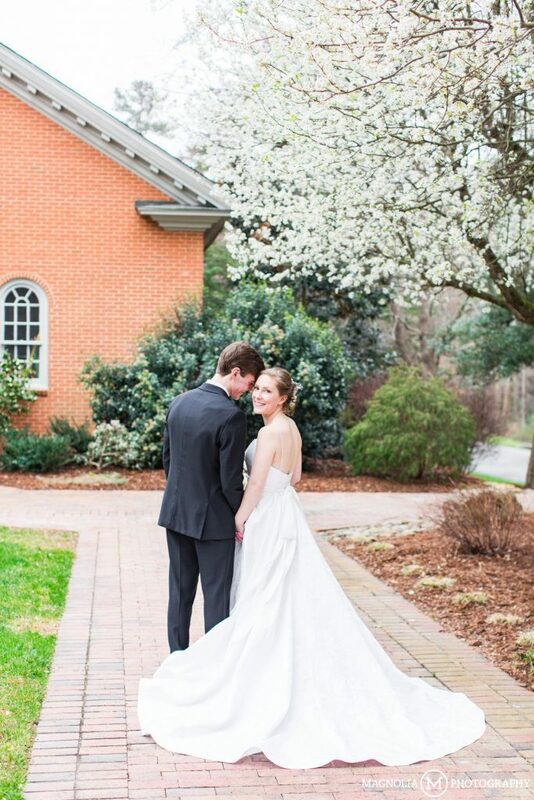 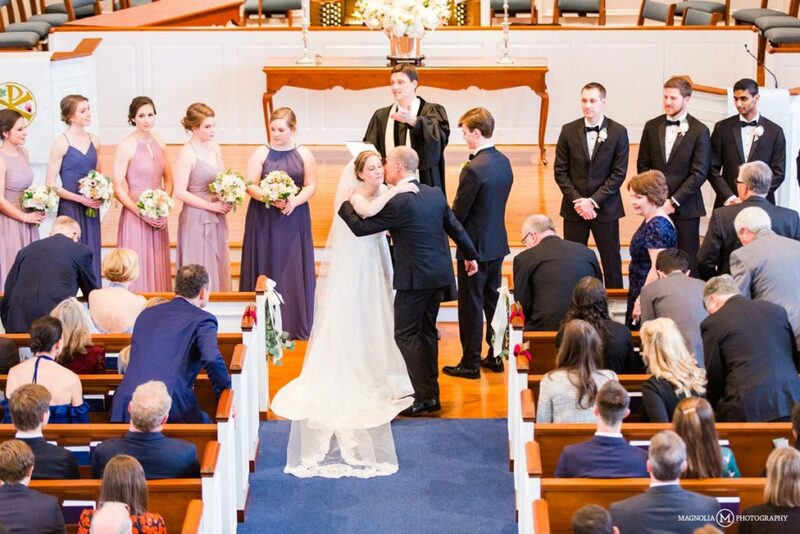 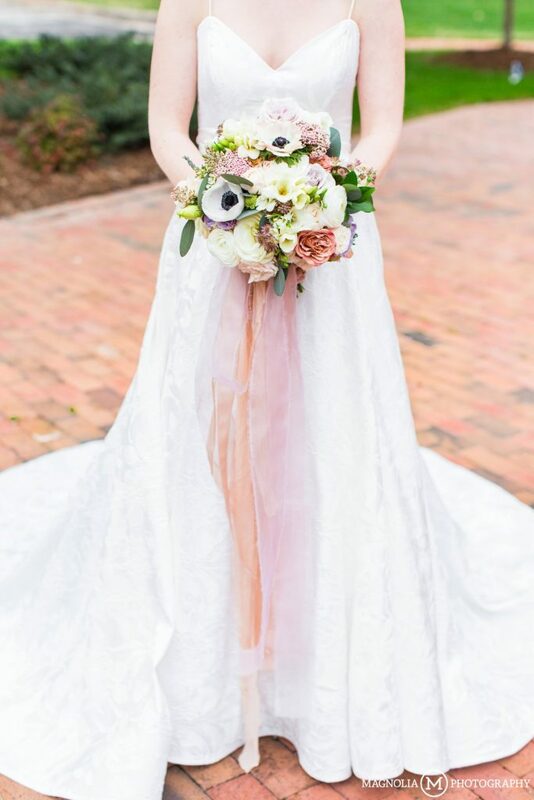 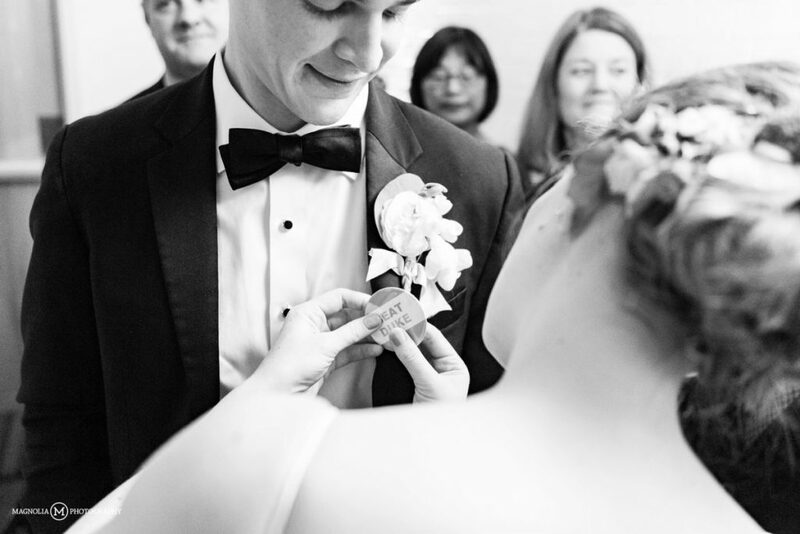 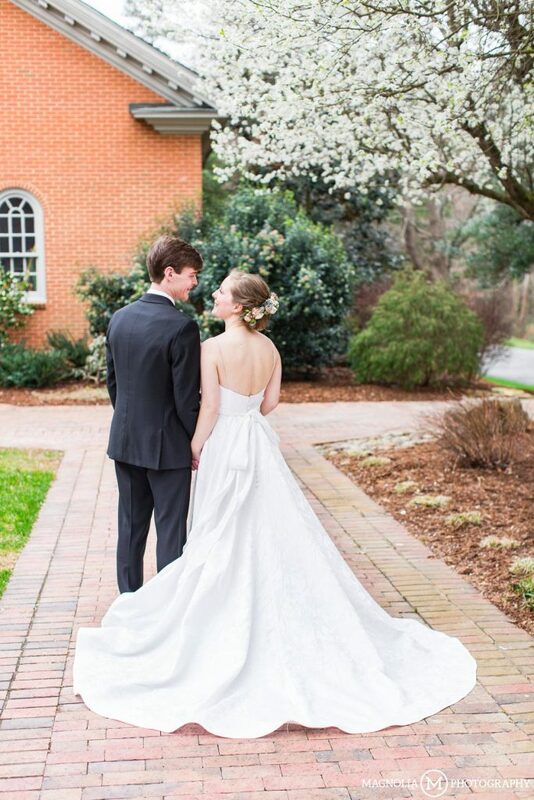 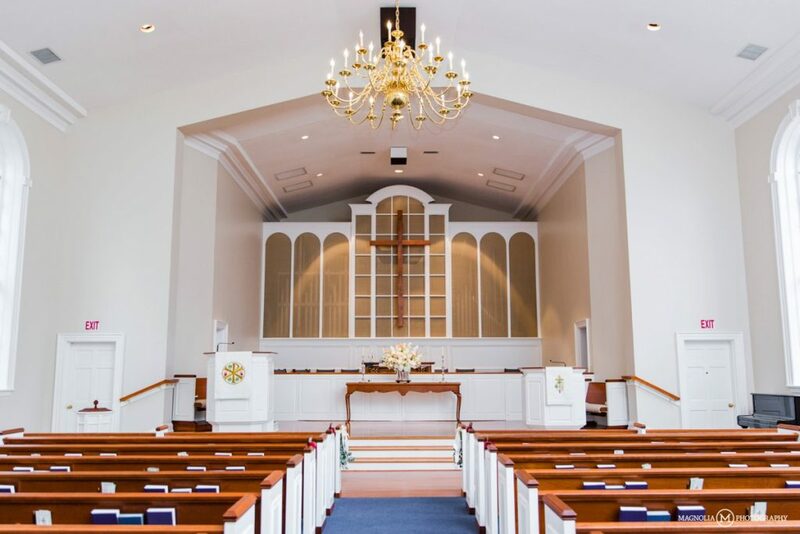 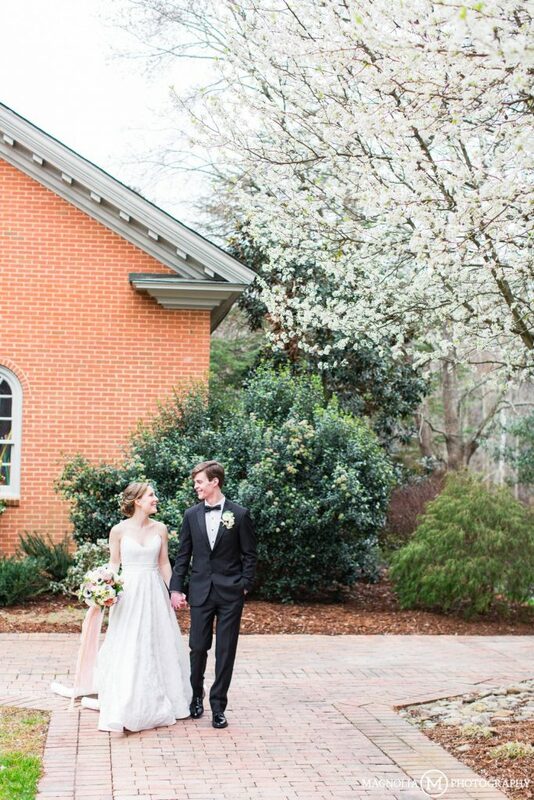 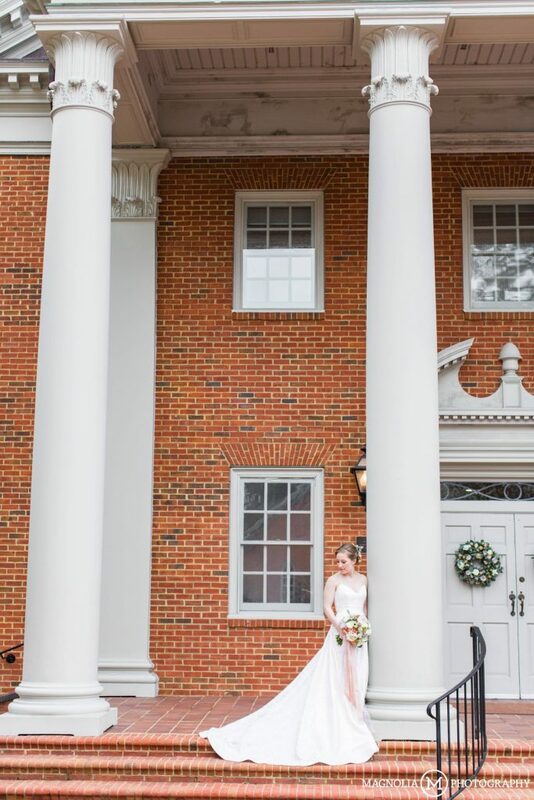 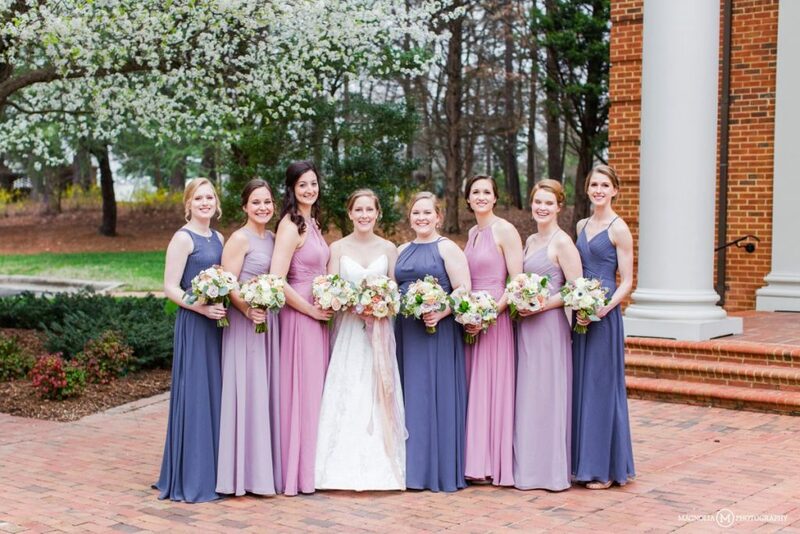 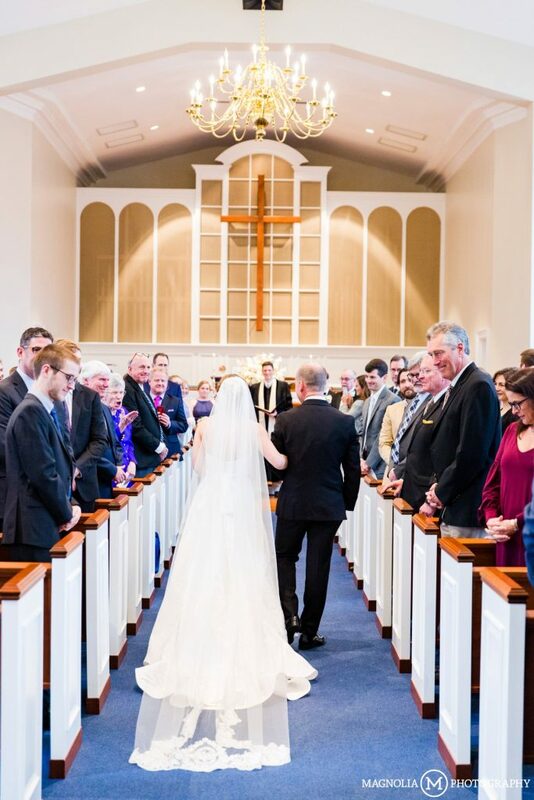 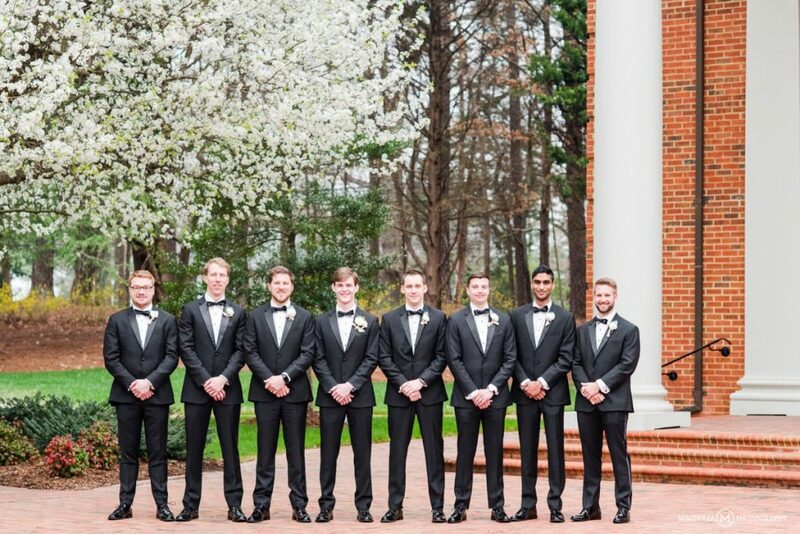 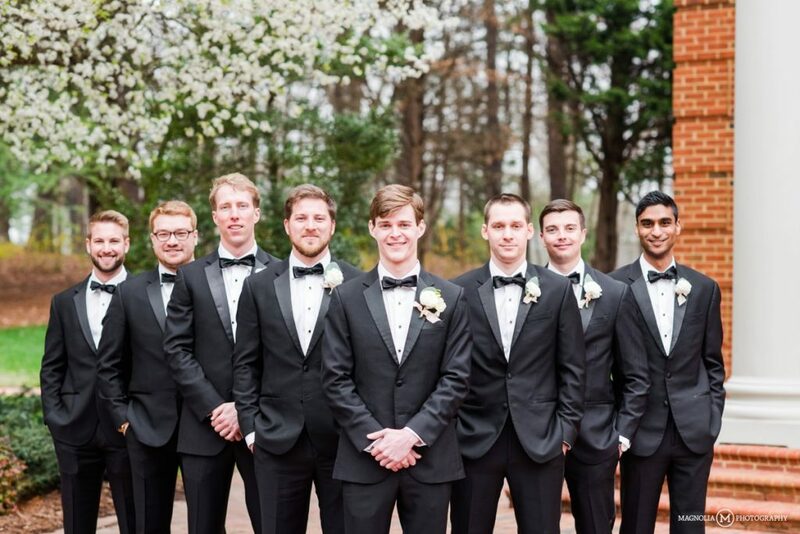 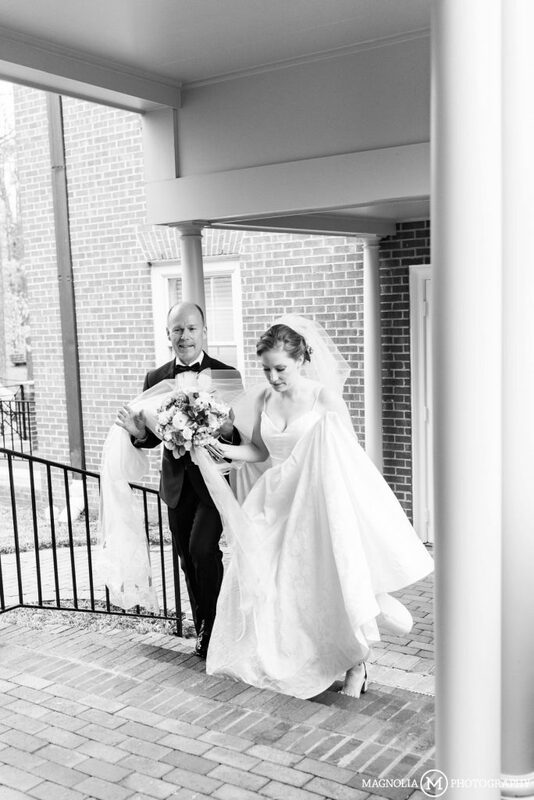 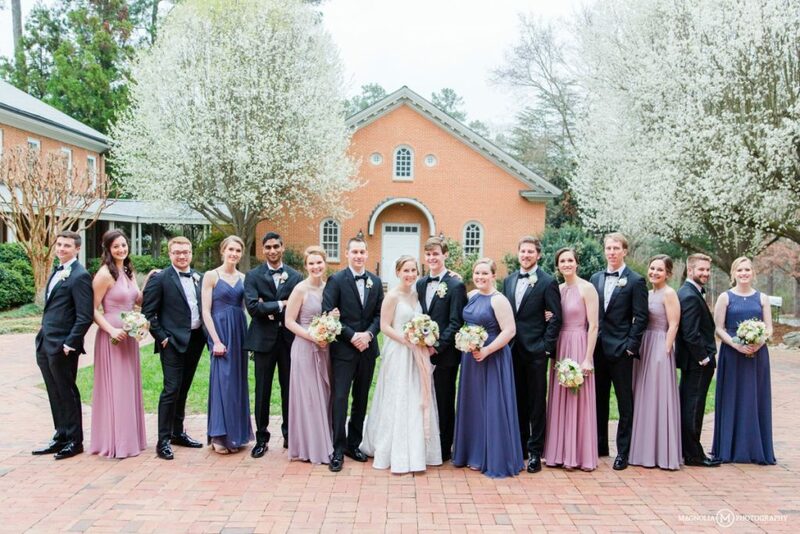 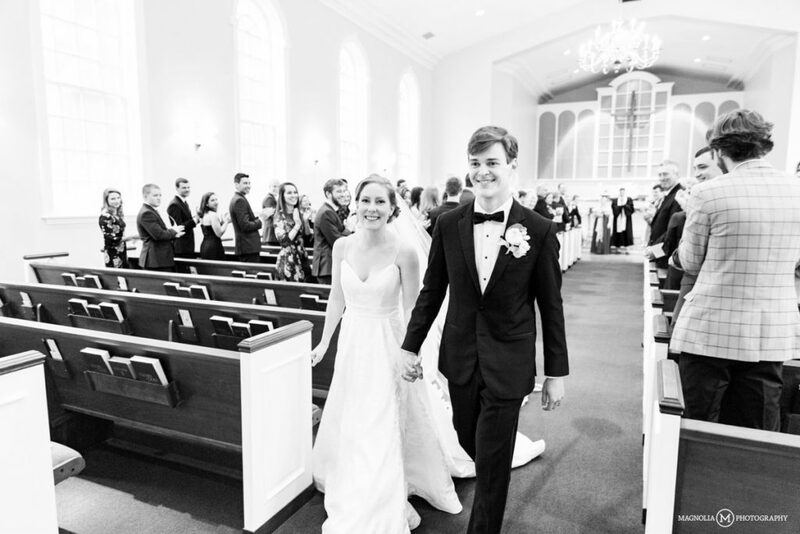 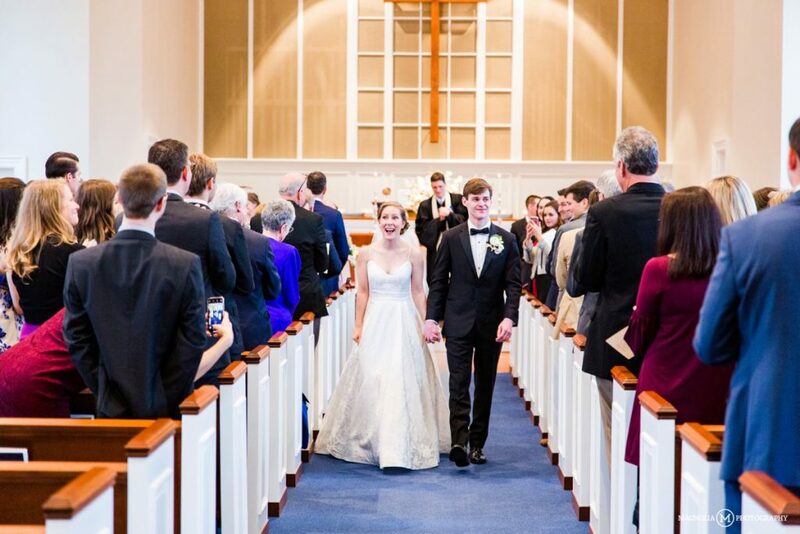 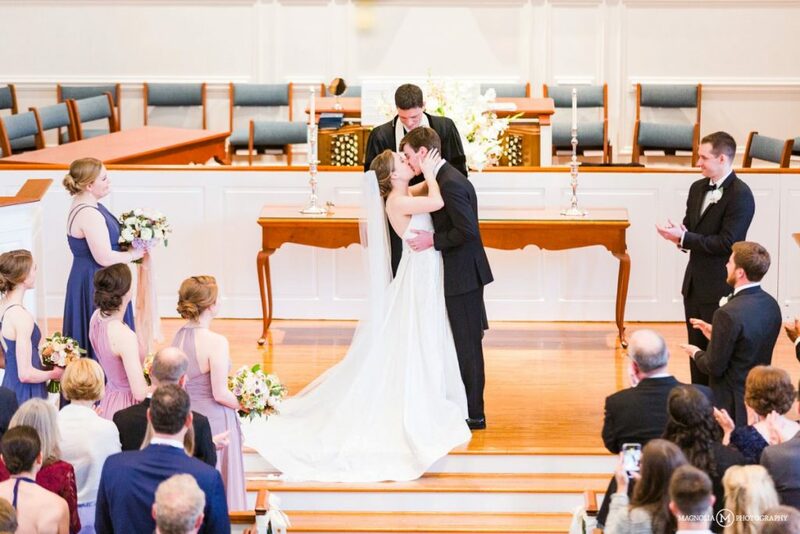 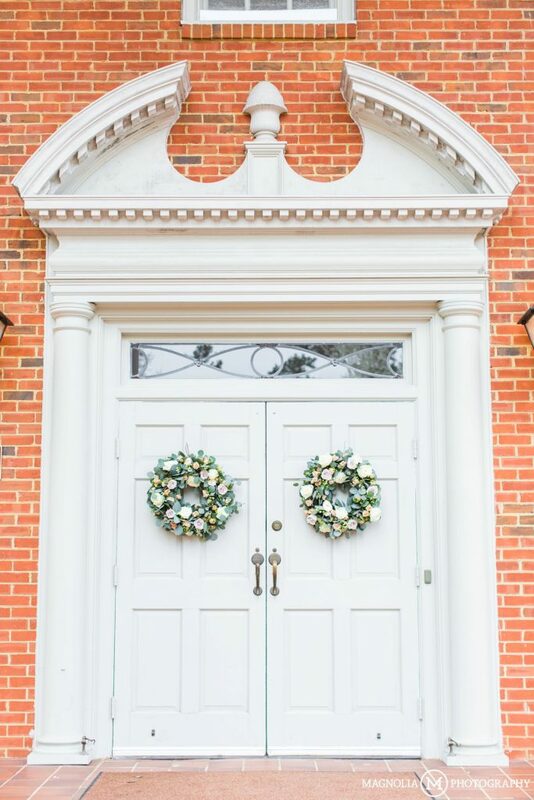 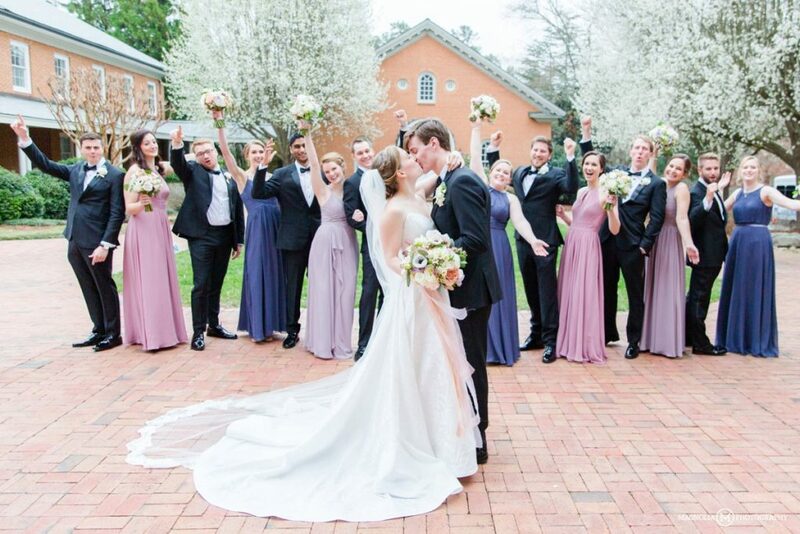 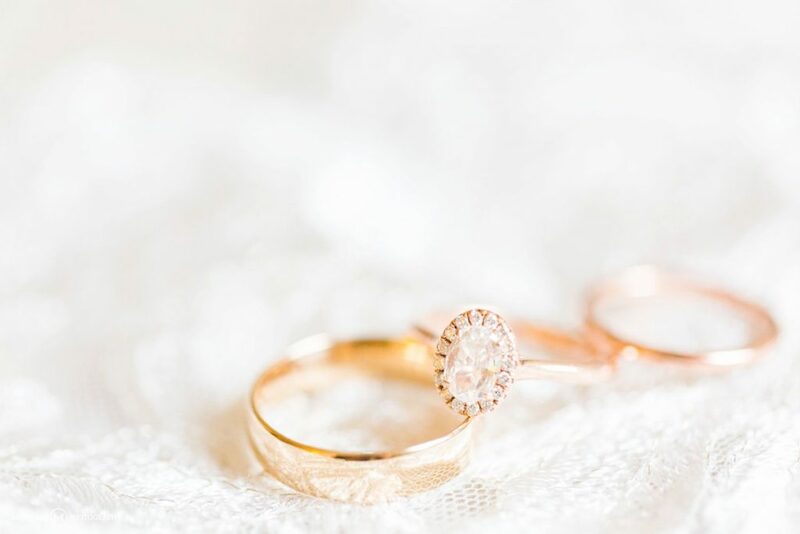 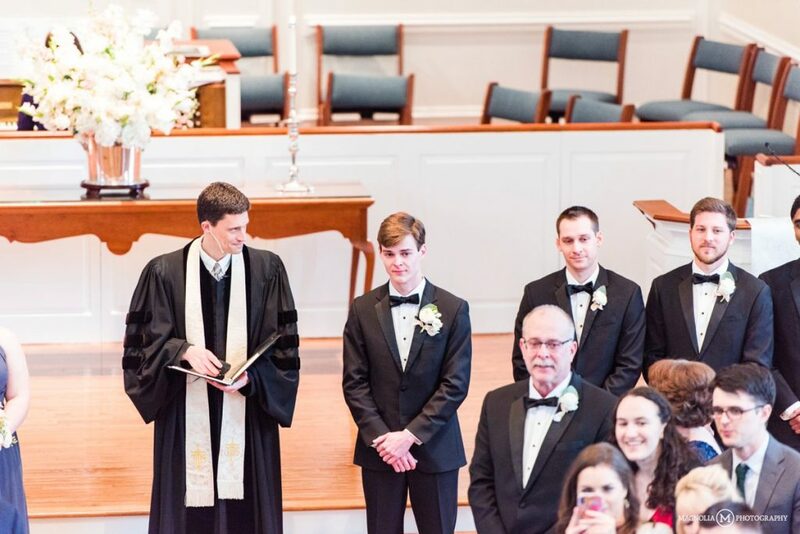 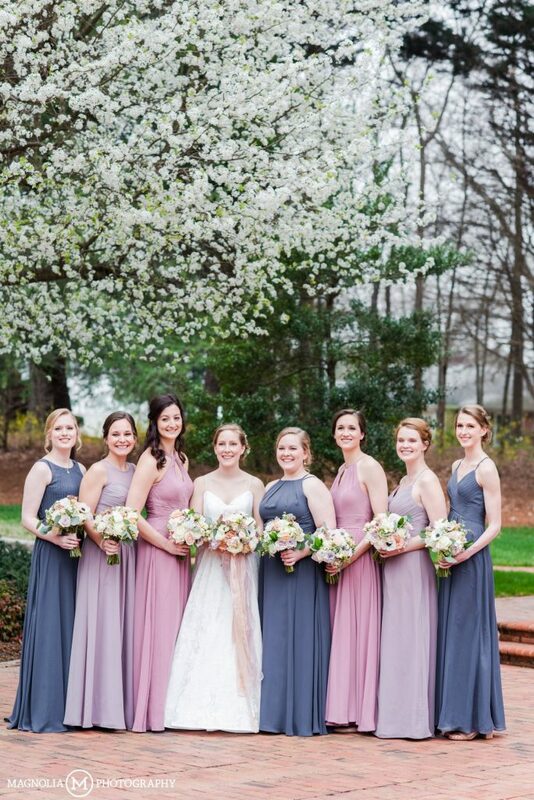 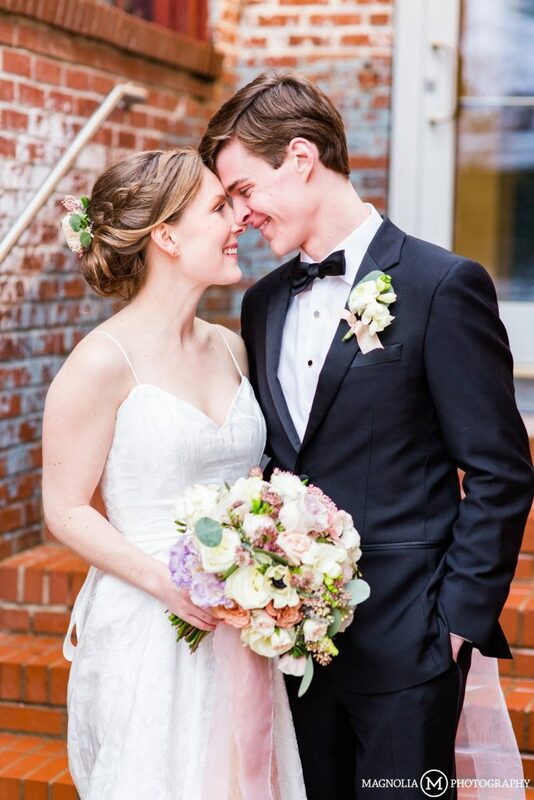 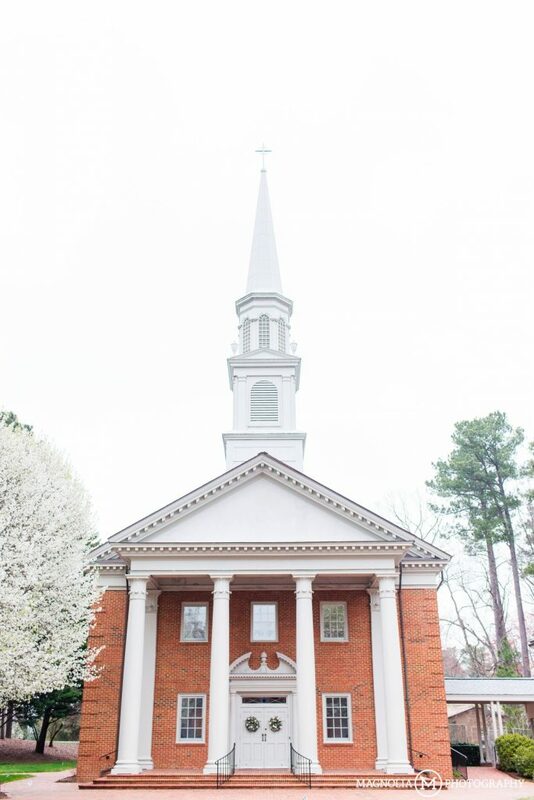 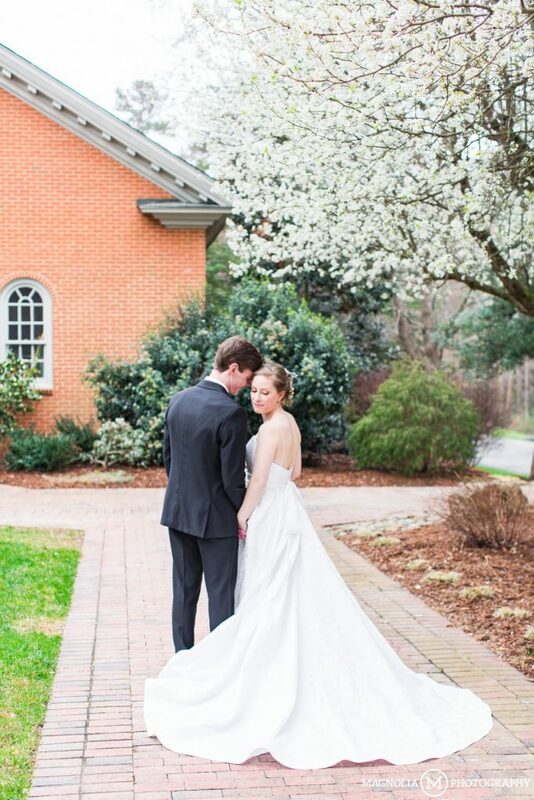 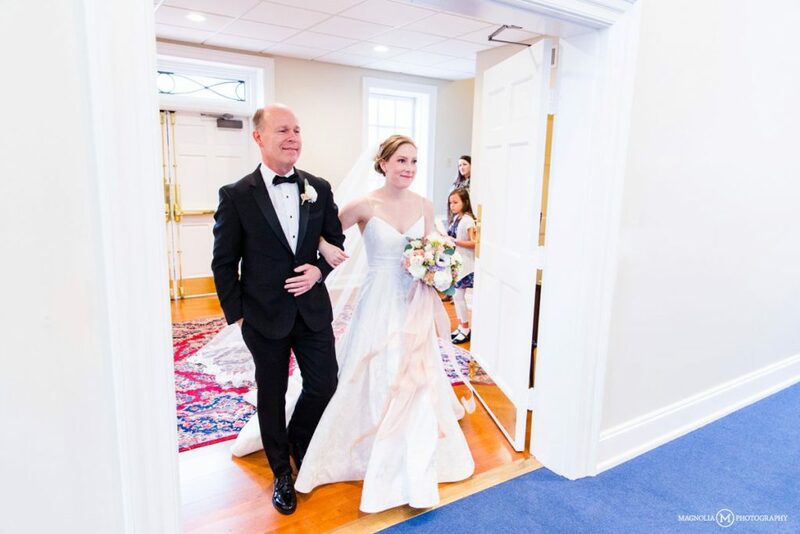 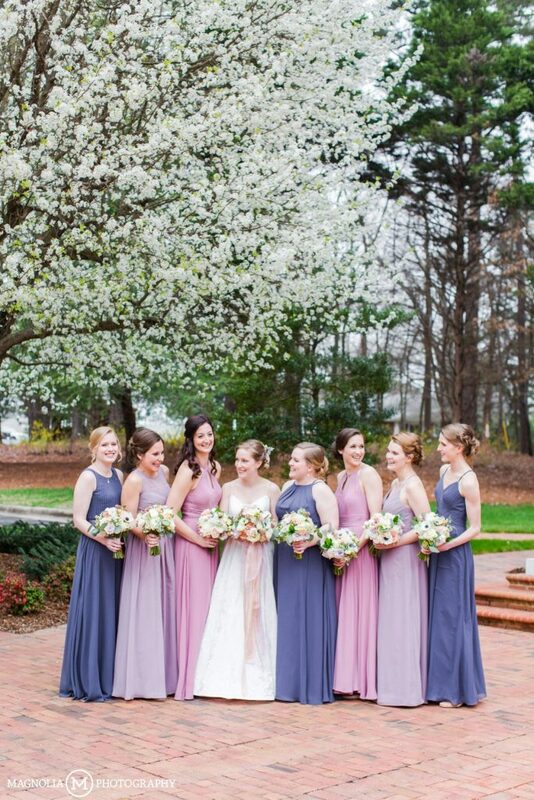 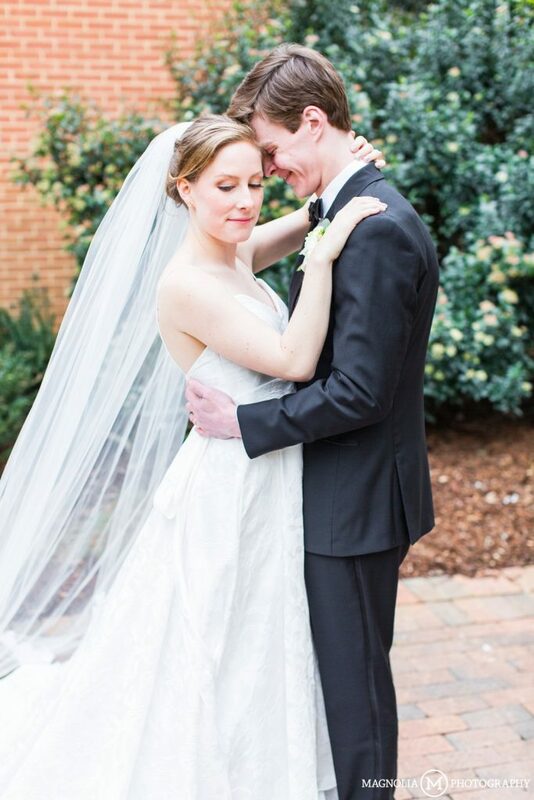 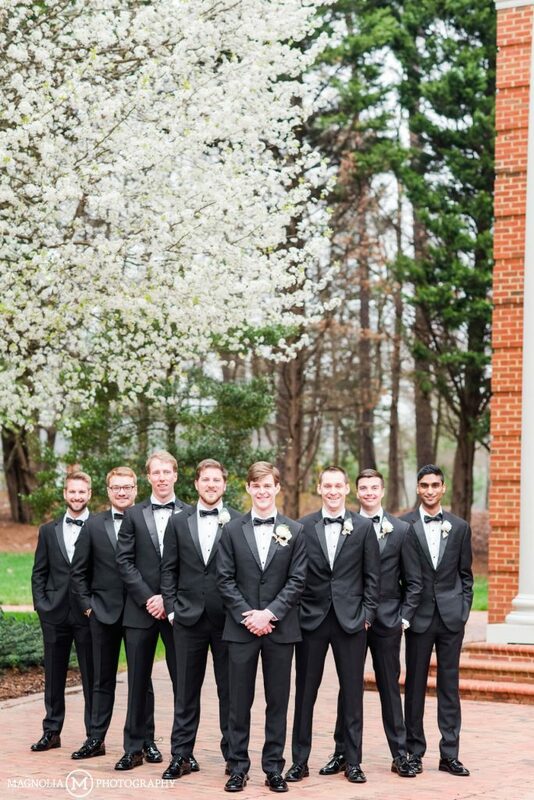 The ceremony took place at the Westminster Presbyterian Church in Durham, North Carolina – a beautiful traditional brick church with lovely natural light inside! 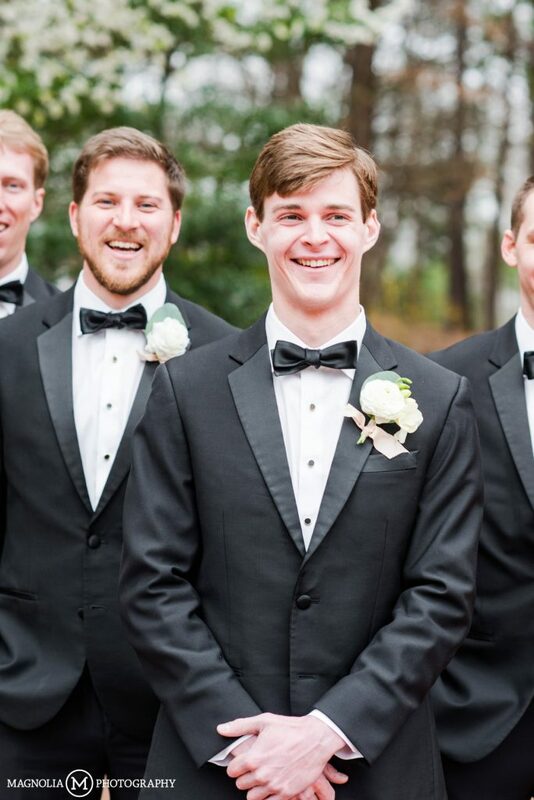 (YES!) 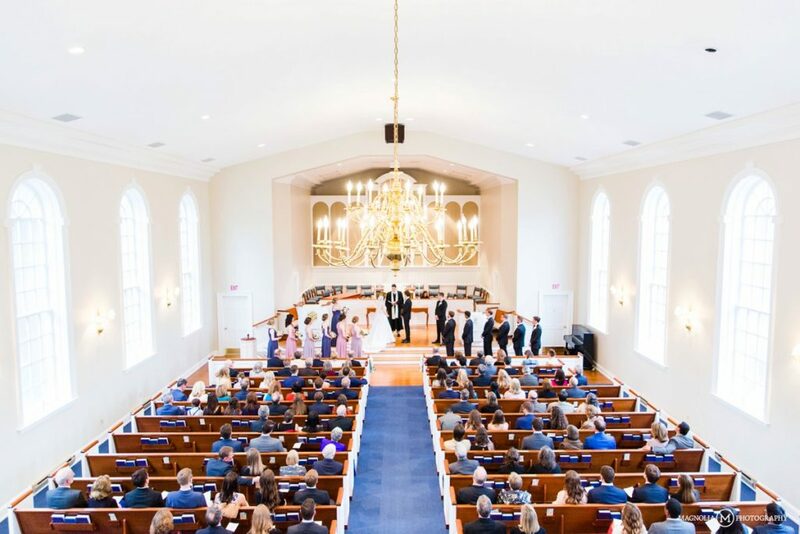 Even on this overcast – it looks like it could rain at any time – day, the interior of the church was blanketed with gorgeous light. 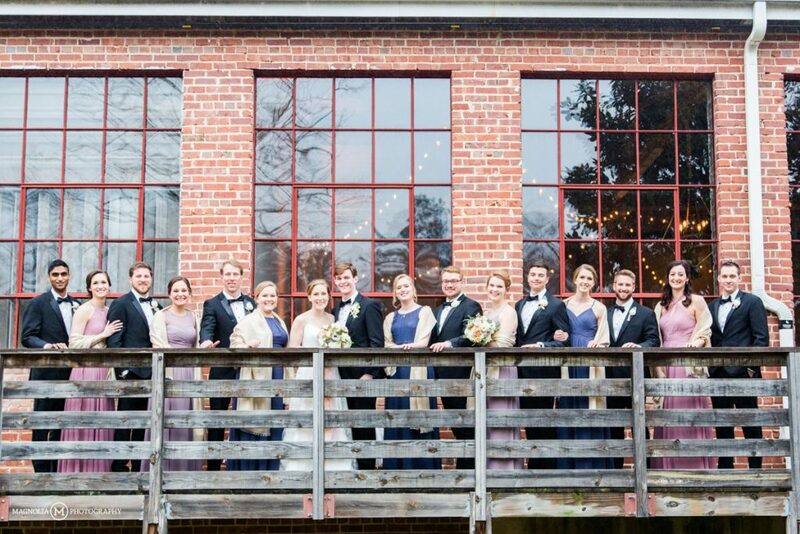 After the ceremony we grabbed some bridal party photos and then snapped some shots of Kristin and Glenn in the courtyard of the church. 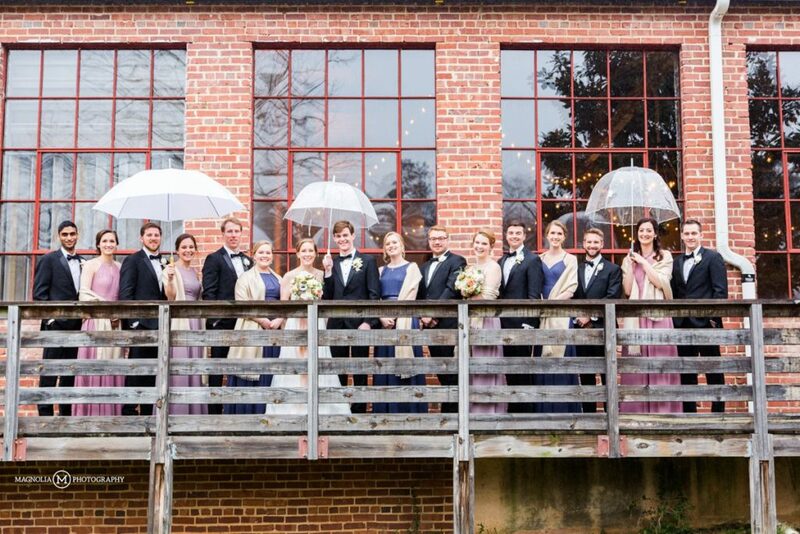 As we drove the 45 minutes to the reception at Forest Hall at Chatham Mills to finish their couples photos and get them in to the reception, the rain began. 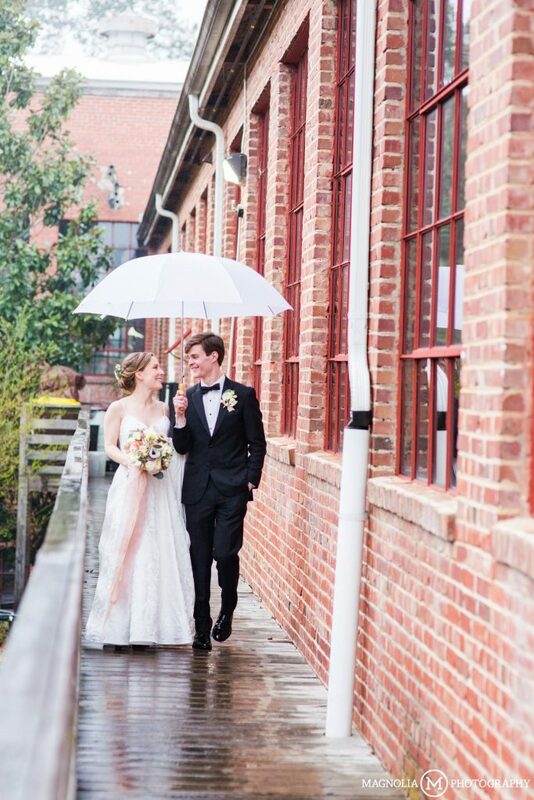 It was a heavy mist, so we managed to spend a few minutes outside with them before they got soaked! 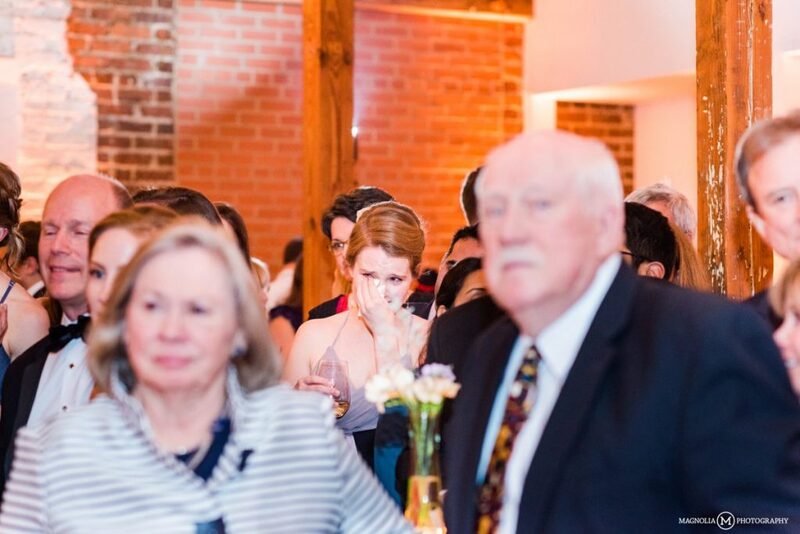 Then, it was on to the reception. 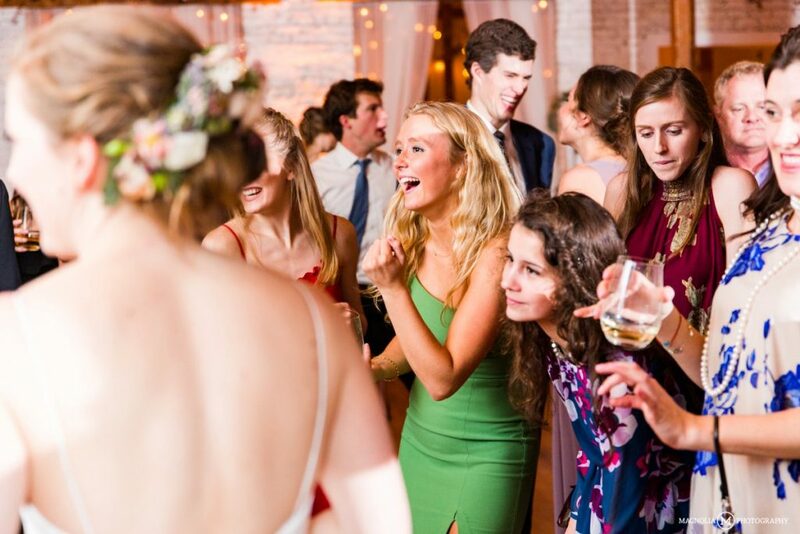 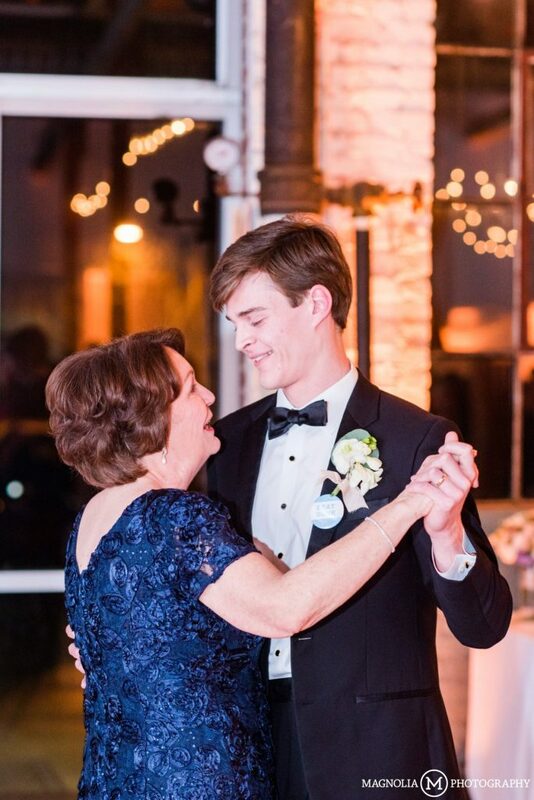 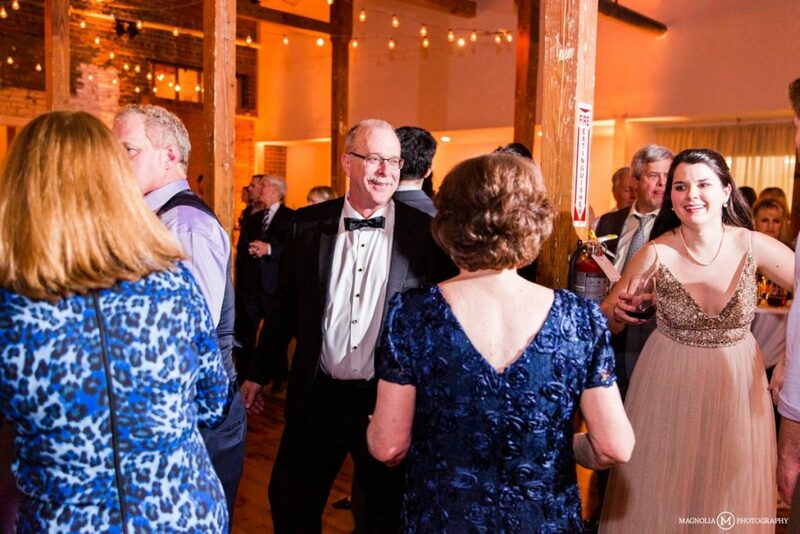 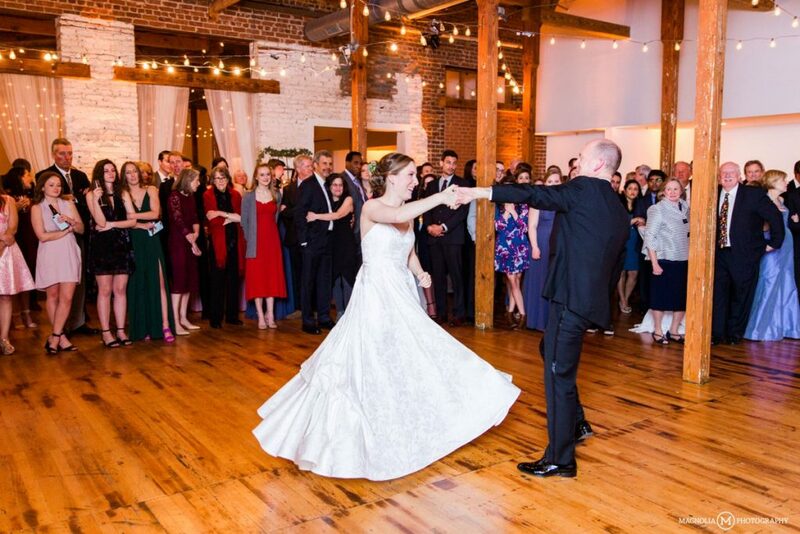 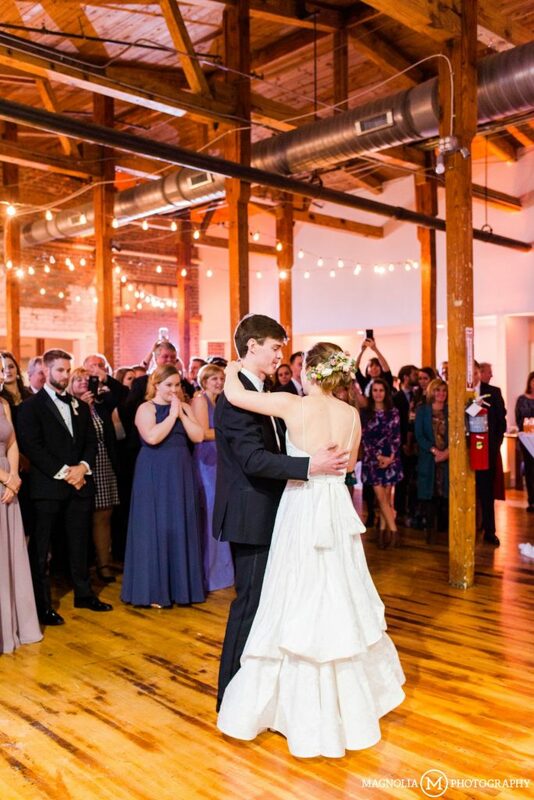 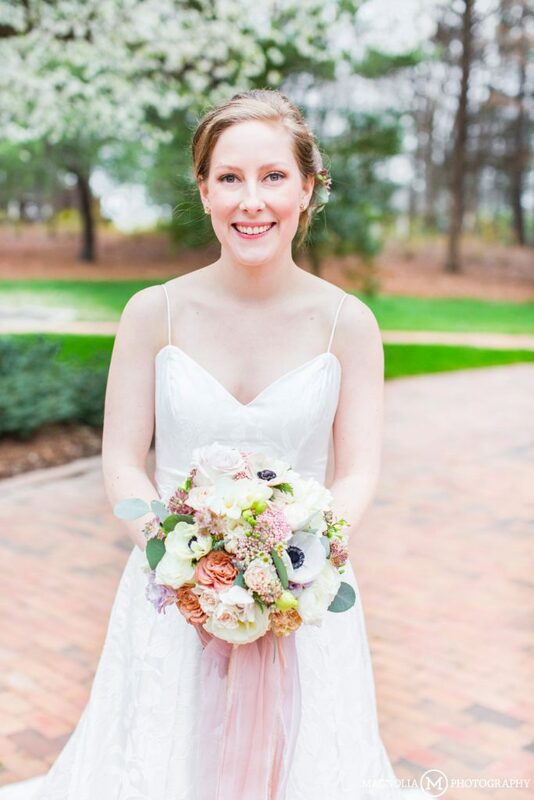 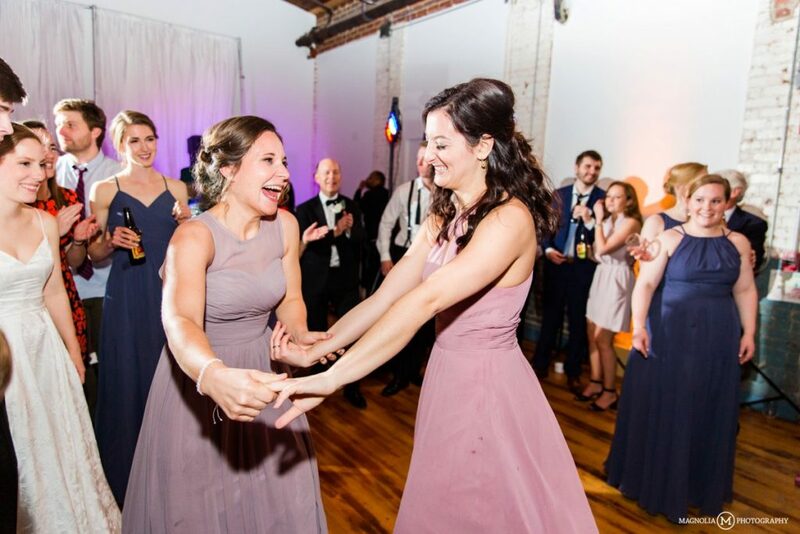 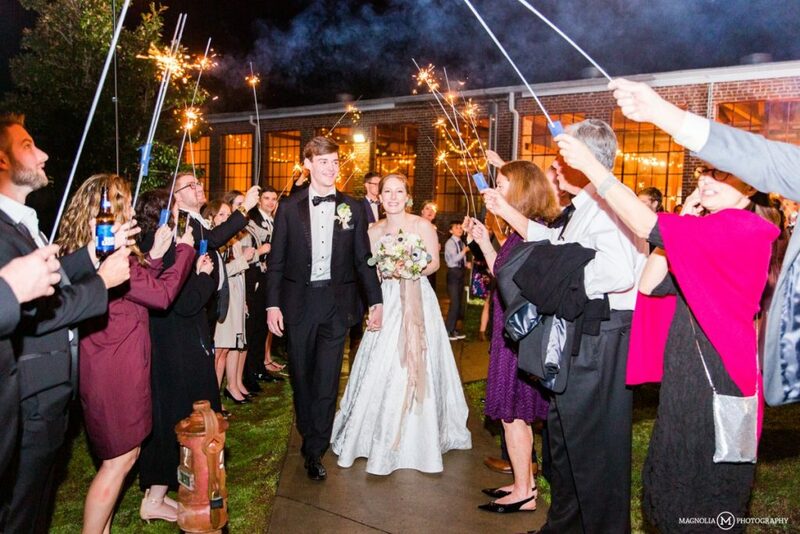 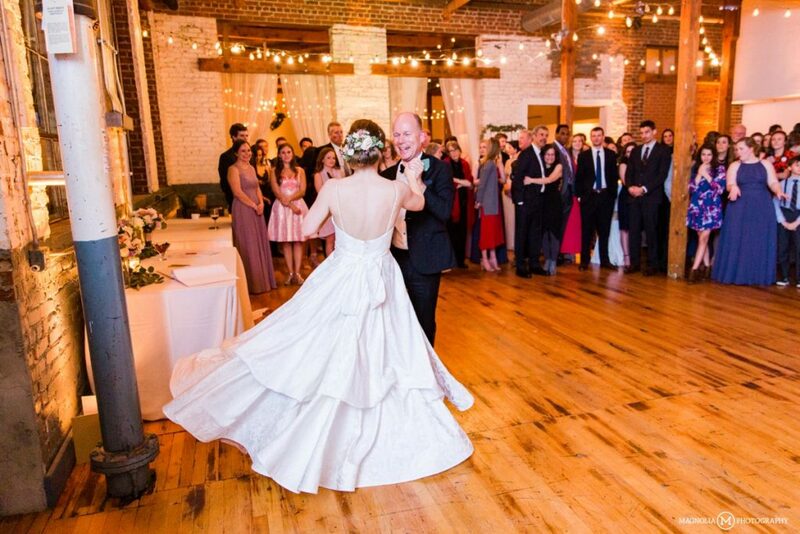 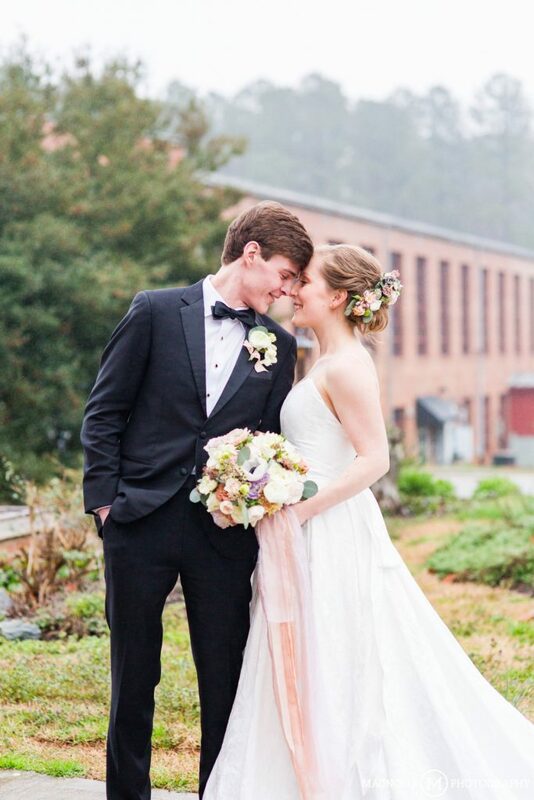 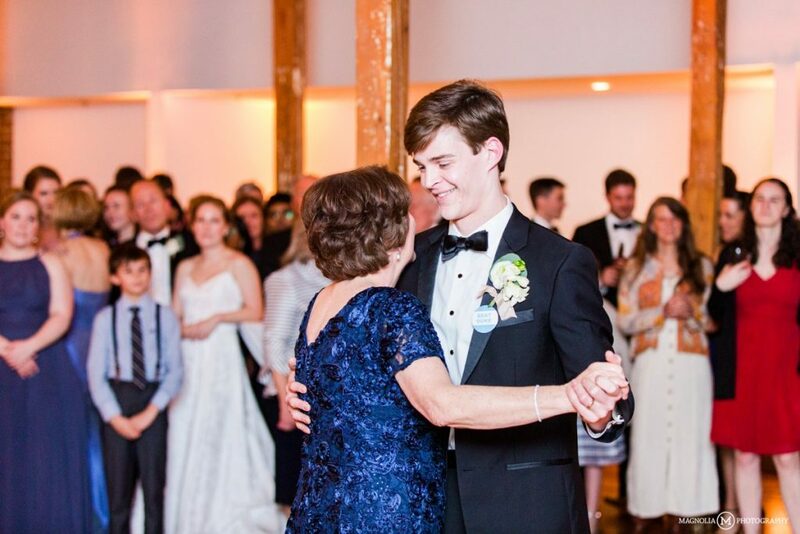 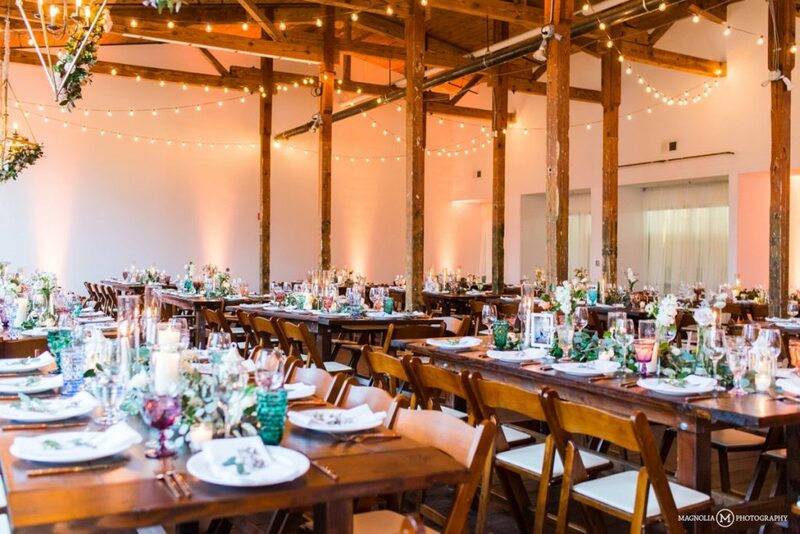 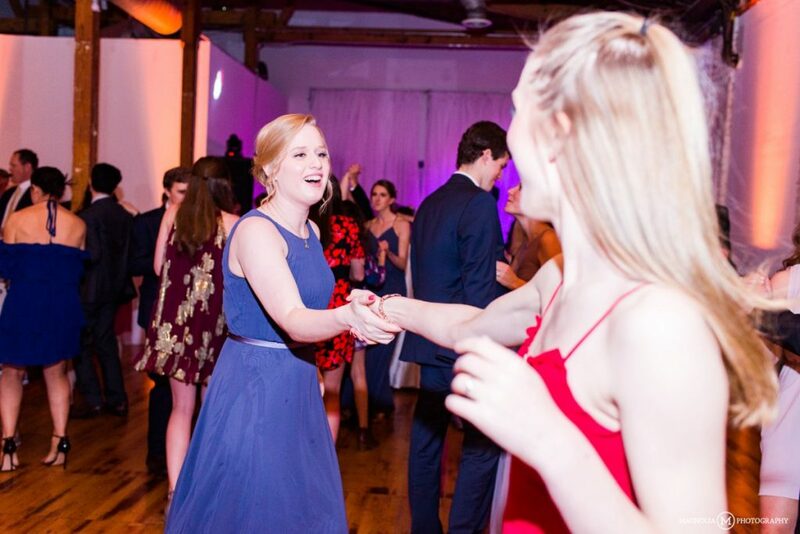 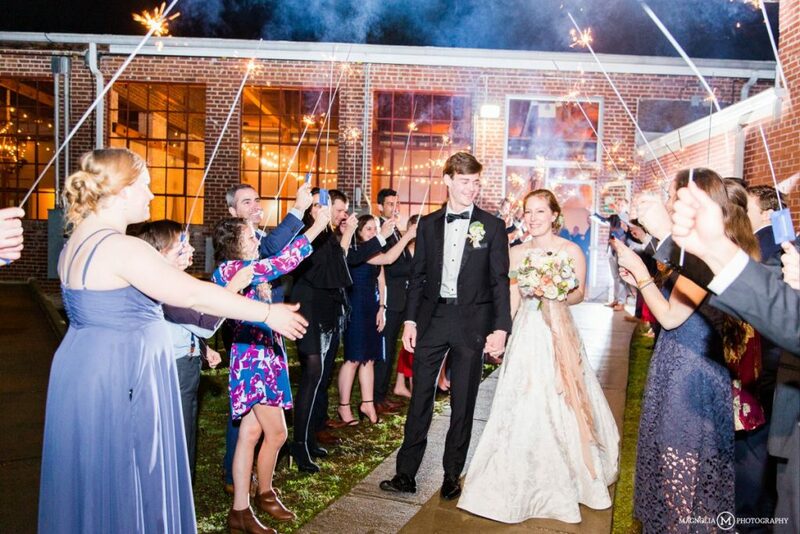 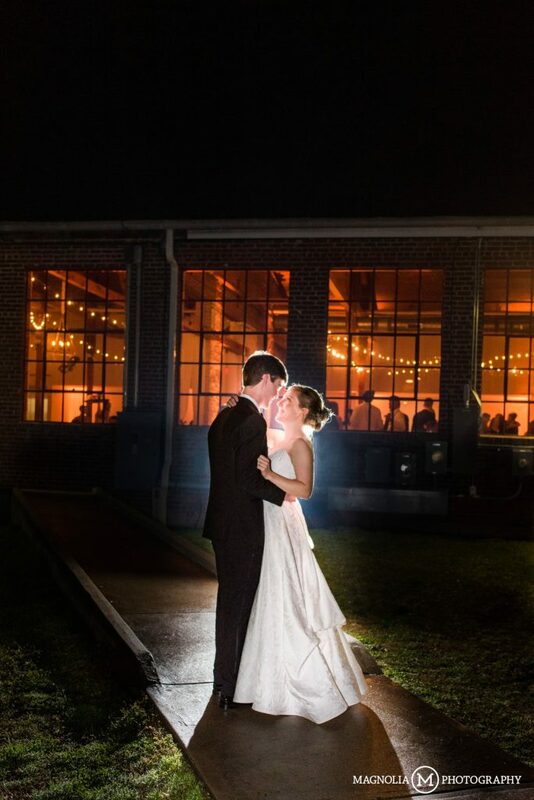 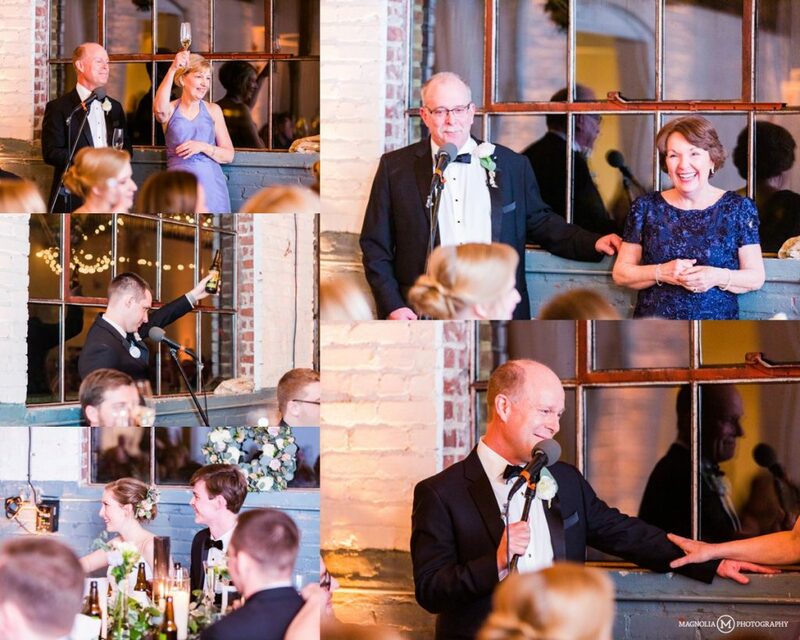 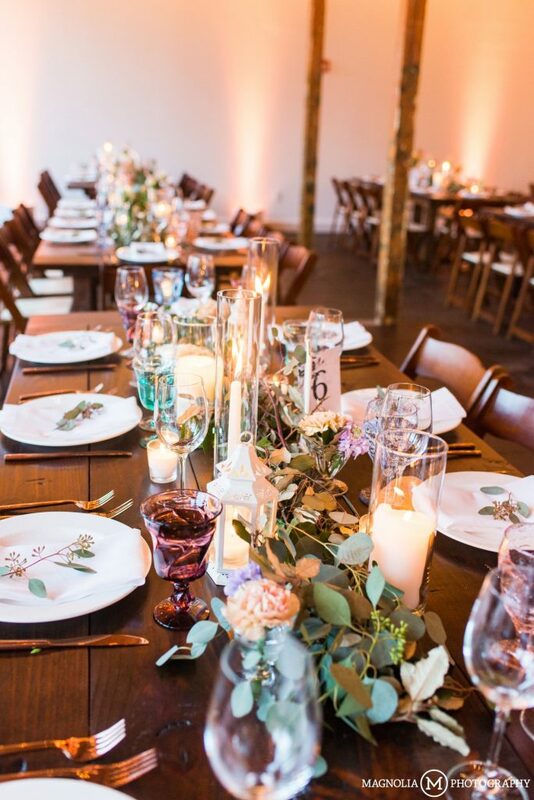 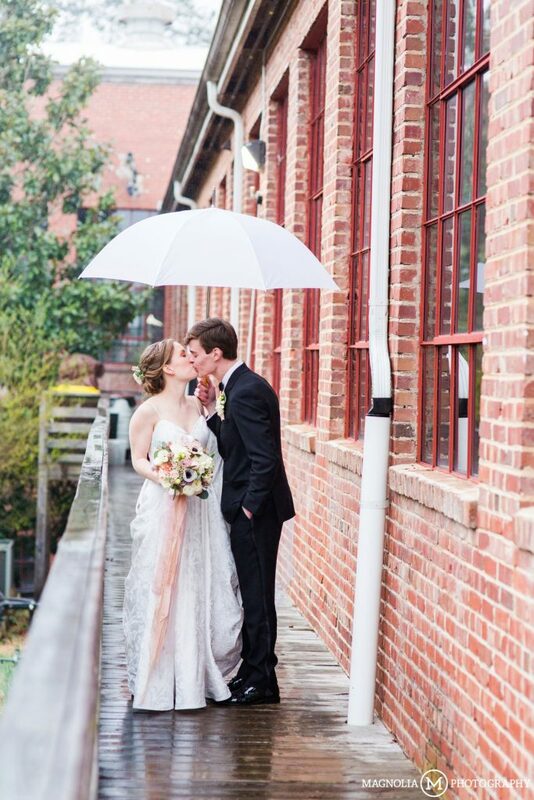 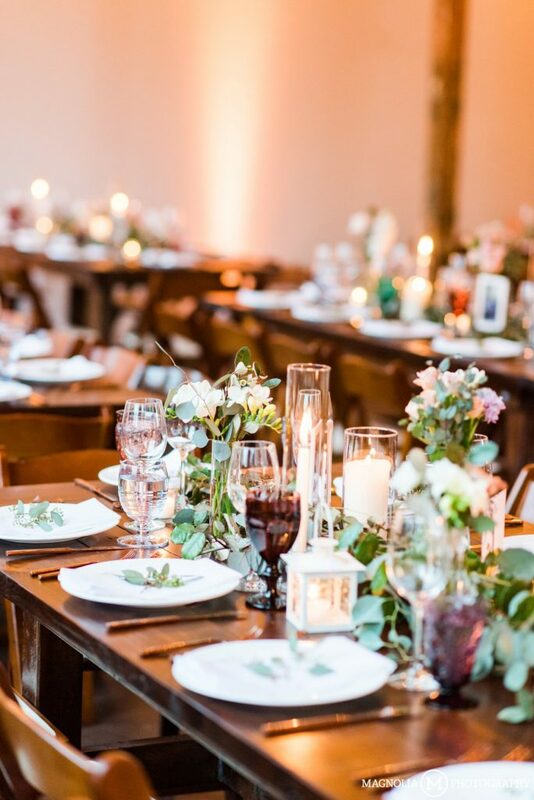 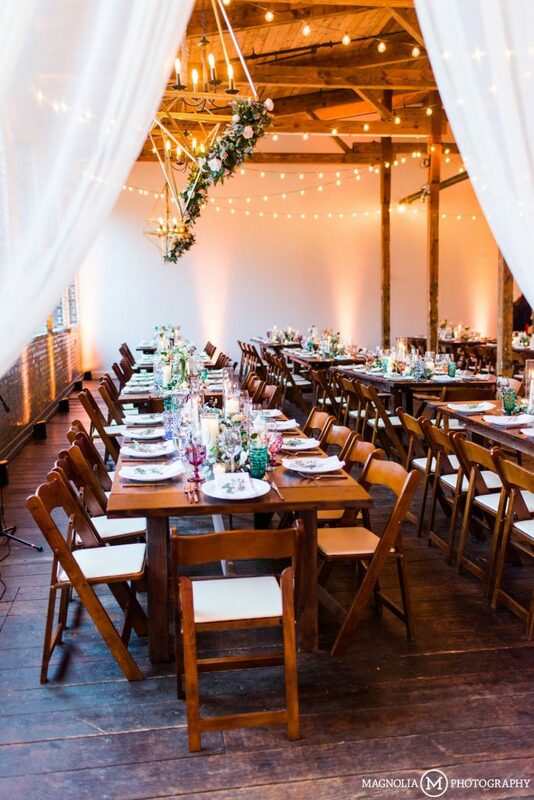 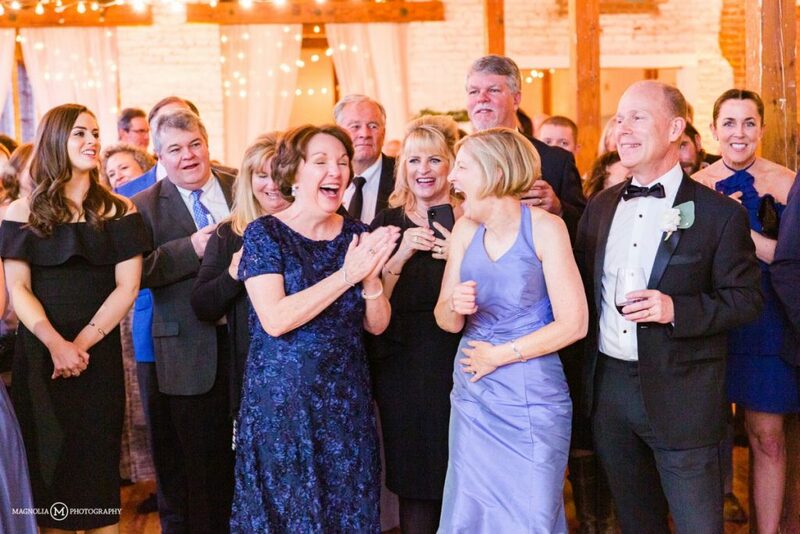 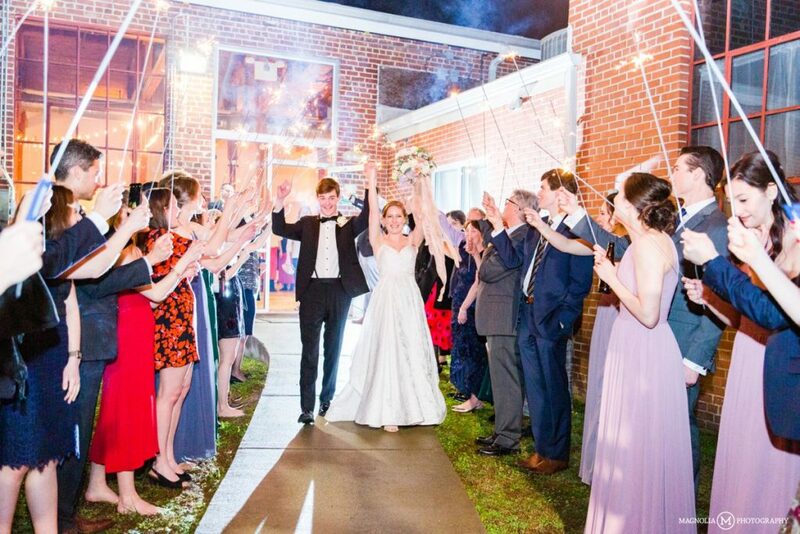 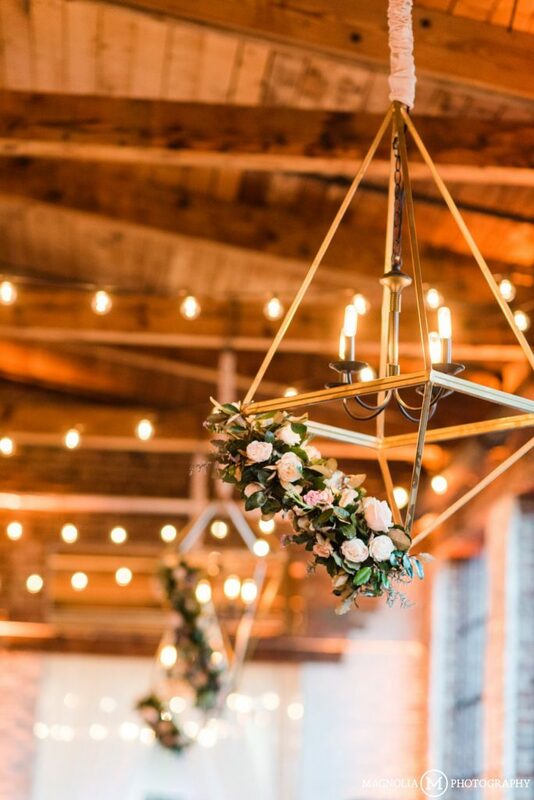 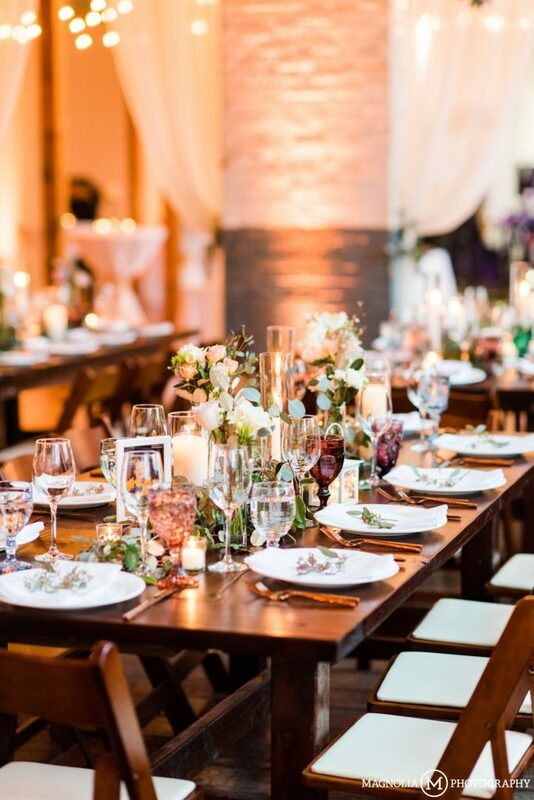 Forest Hall at Chatham Mills is a restored mill in Pittsboro, NC – with original windows and wood floors it has a rustic feel but the few white brick and white accent walls keep it light and open feeling – a perfect mix for a reception venue! 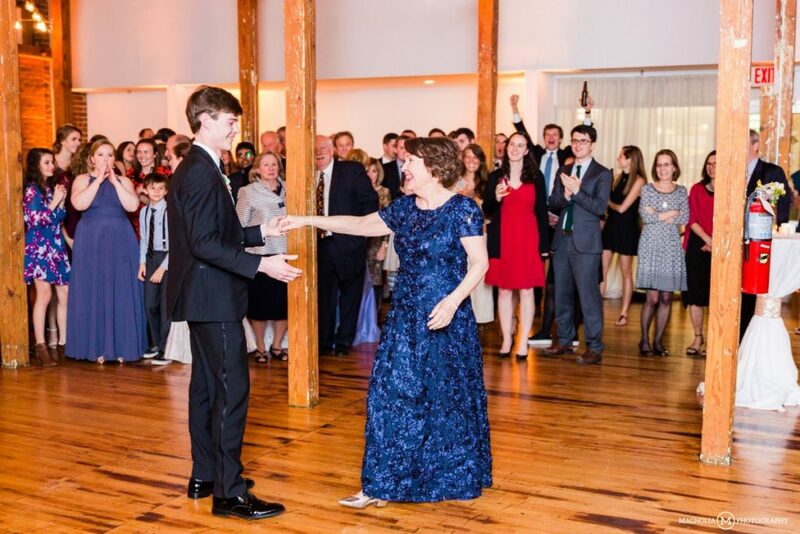 Once the formal dances and dinner were done, it was time for toasts! 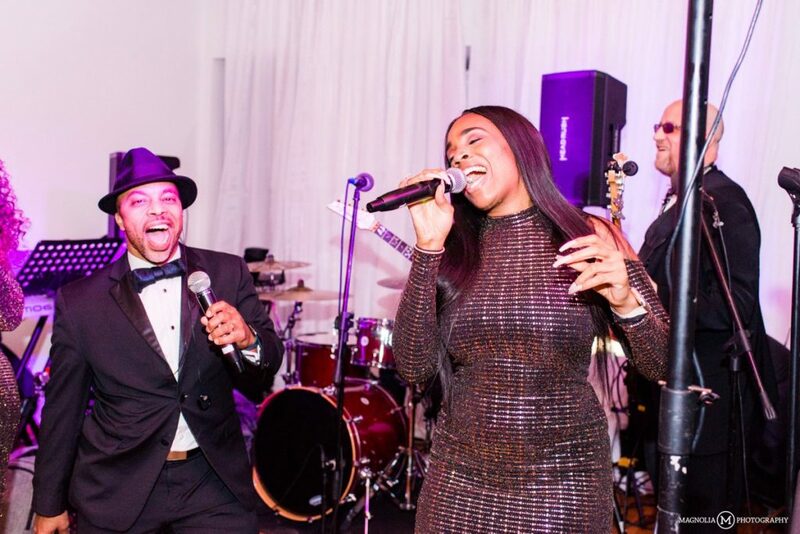 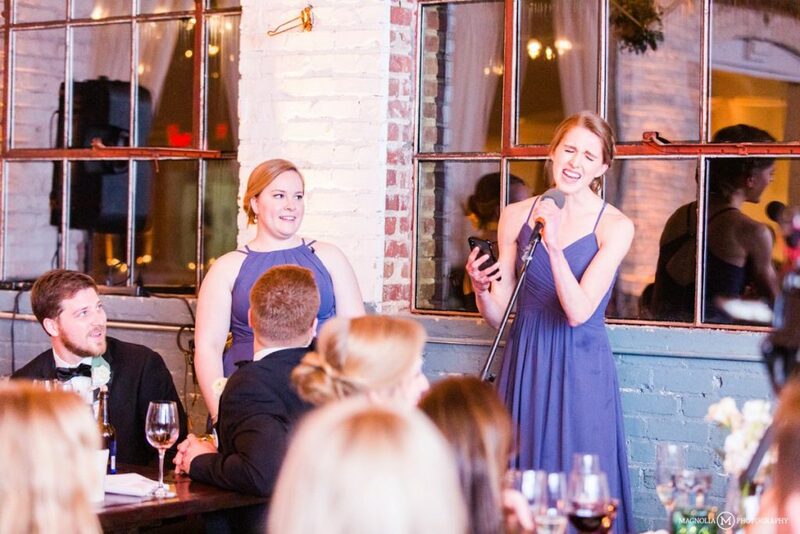 For the second time this year, a new rendition/parody of a hit song was created by bridesmaids to toast the bride and groom, this time it was to the tune of Bennie and the Jets. 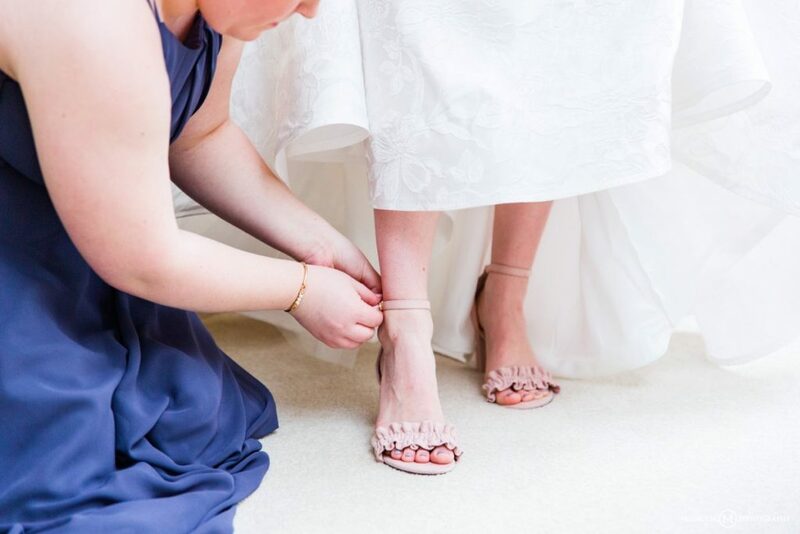 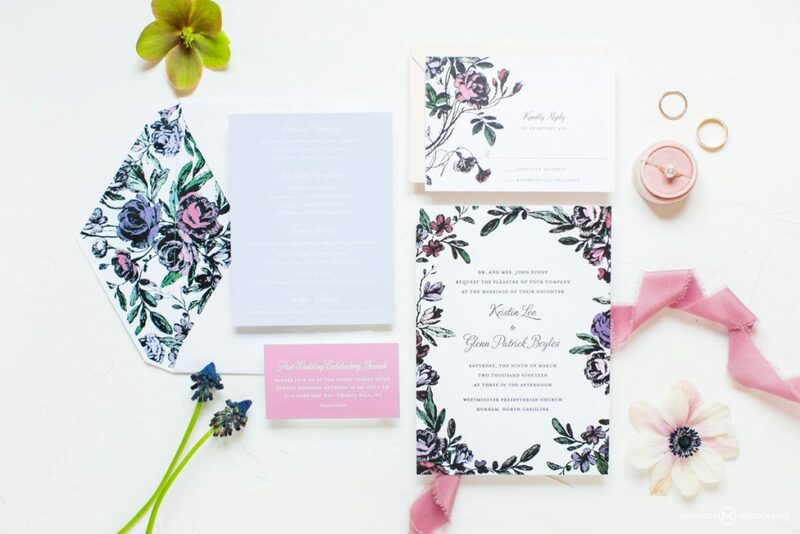 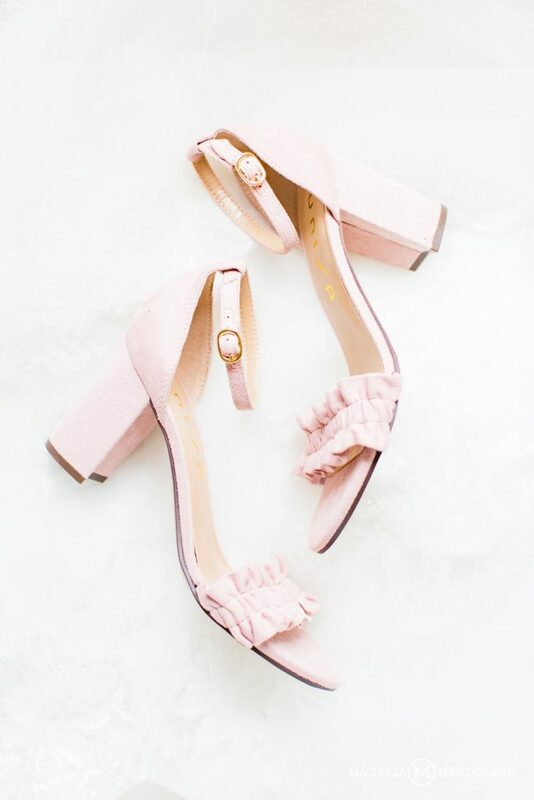 We are really loving this trend and hope that it keeps on happening! 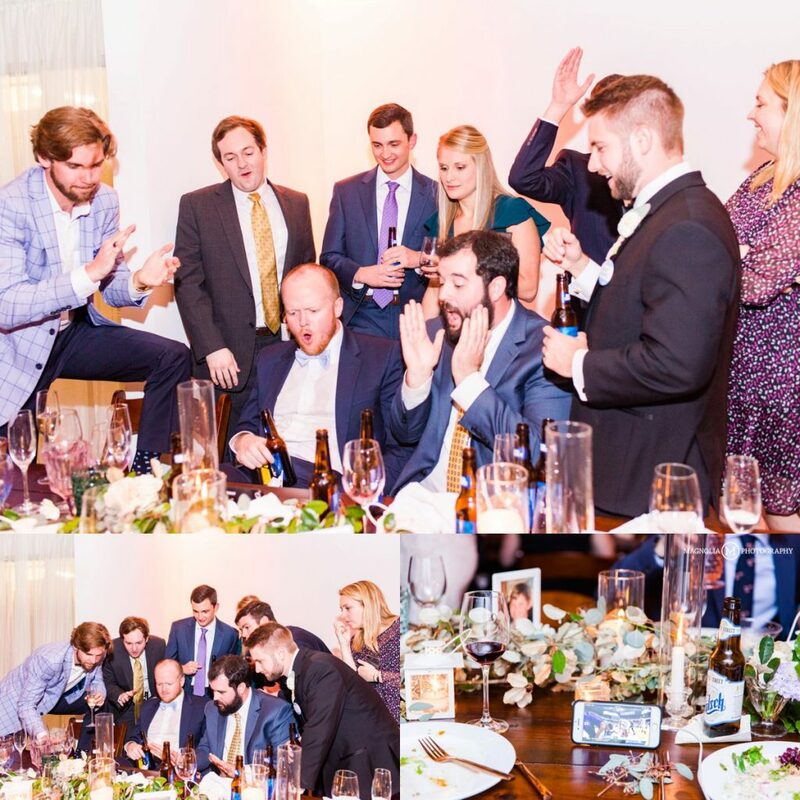 After toasts, the die-hard UNC and Duke fans retired to streaming the game on cell phones plugged in to extension cords (I can’t make this stuff up), and everyone else spent the evening dancing and jamming with the band. 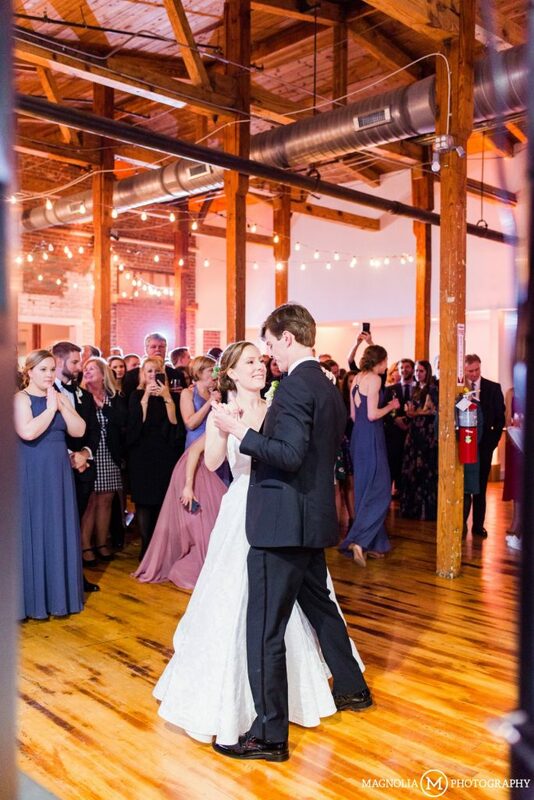 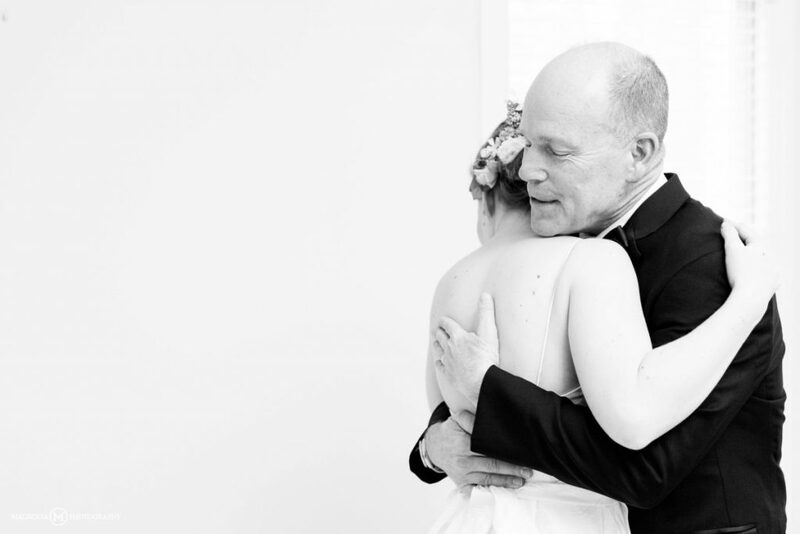 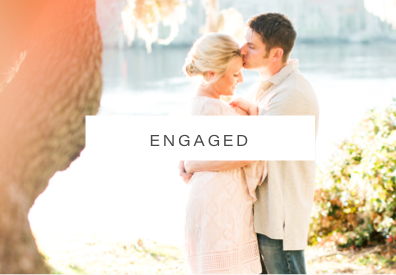 Congratulations Kristin and Glenn – we’re so happy for you guys – xo! 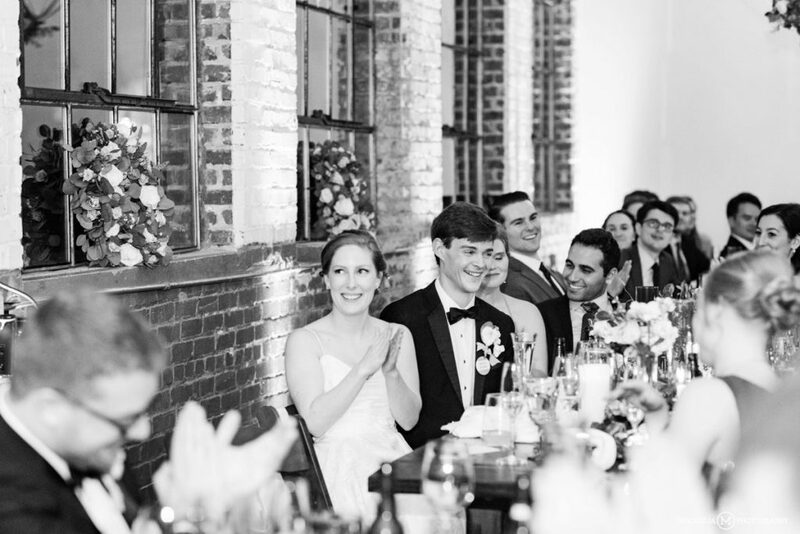 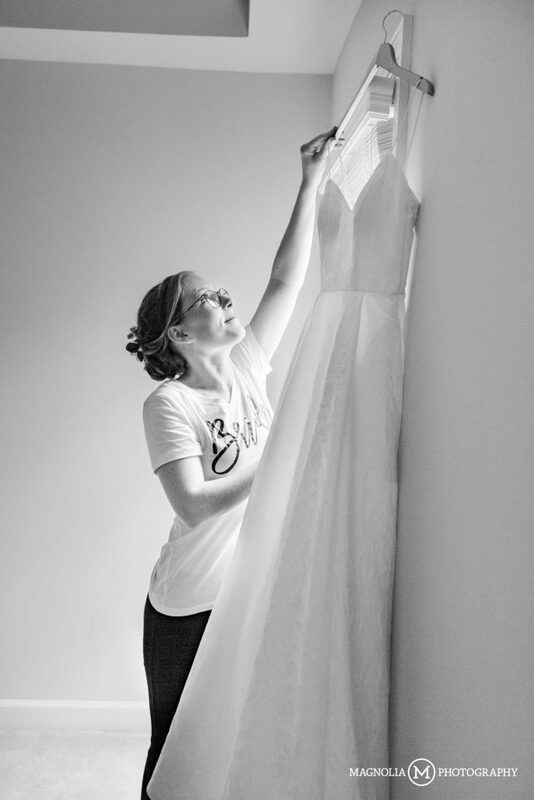 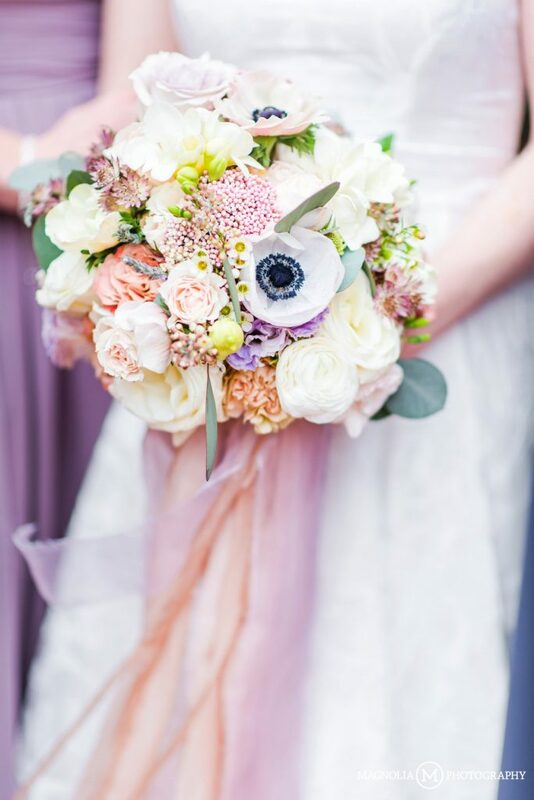 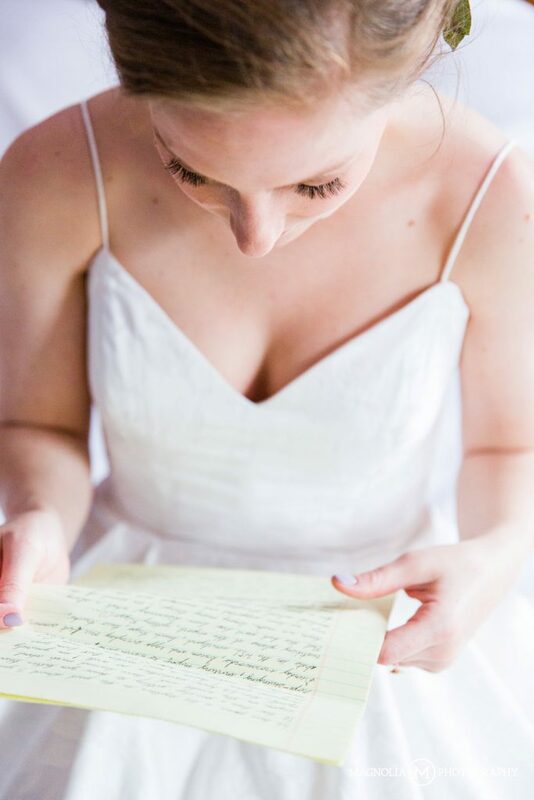 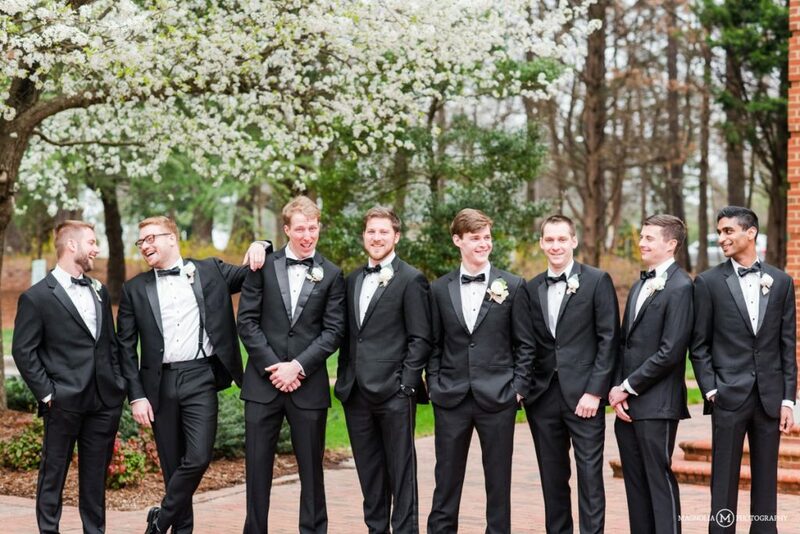 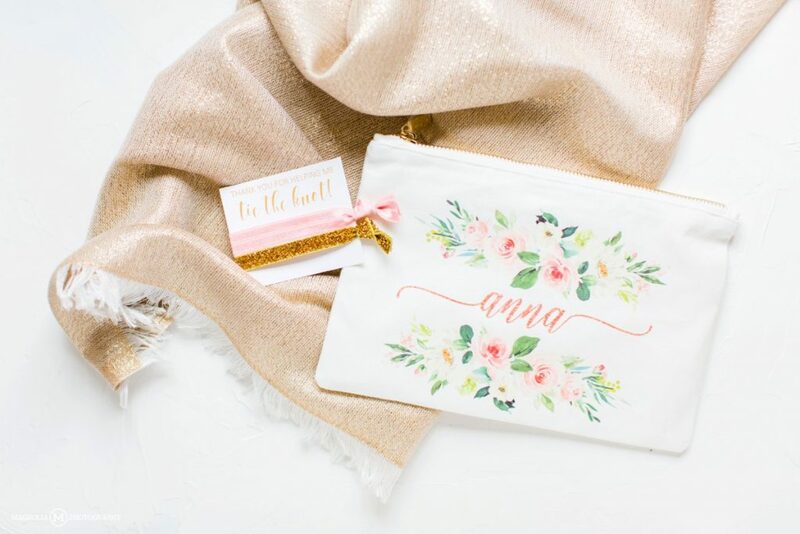 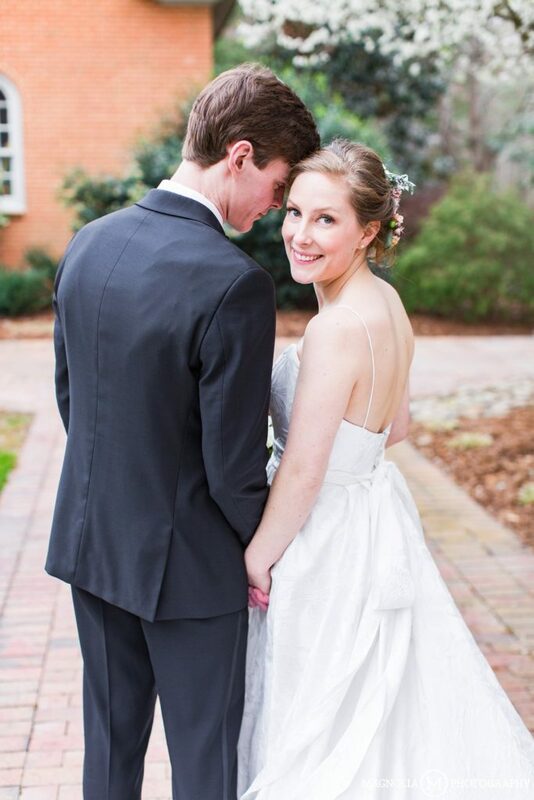 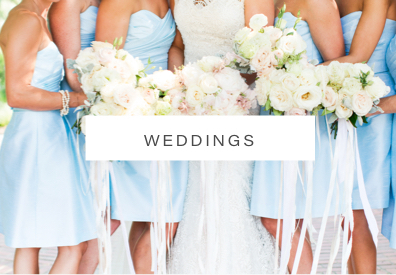 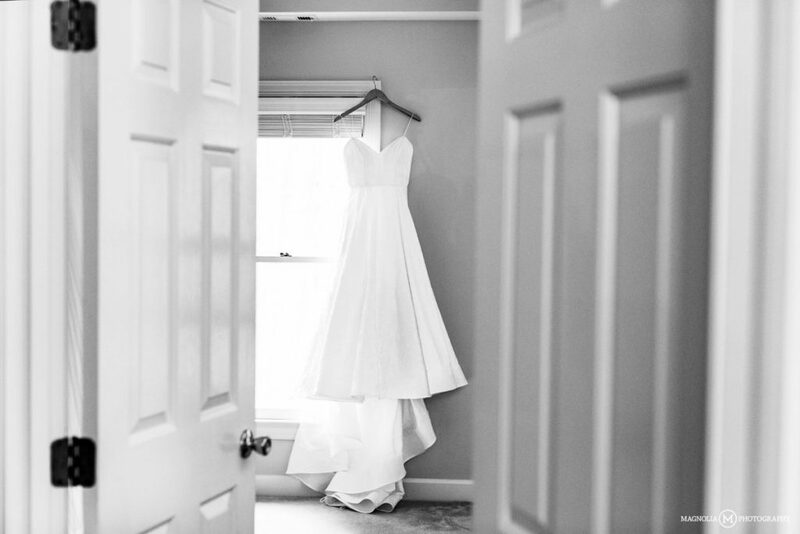 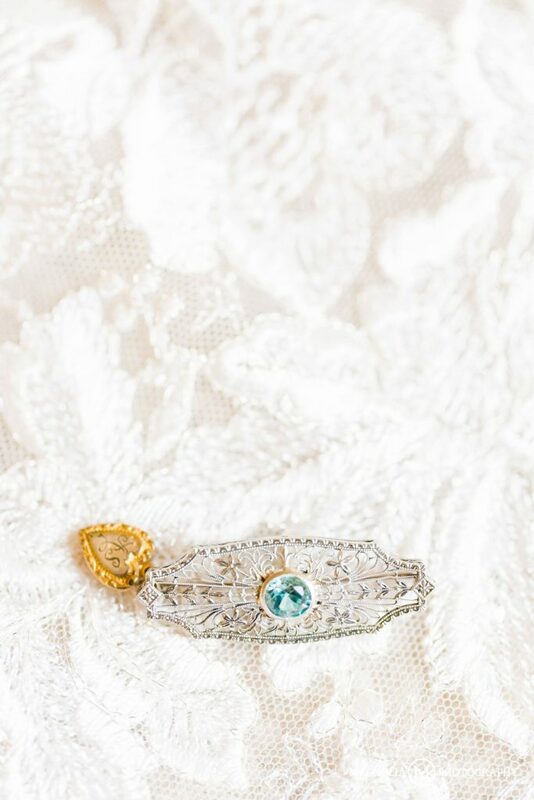 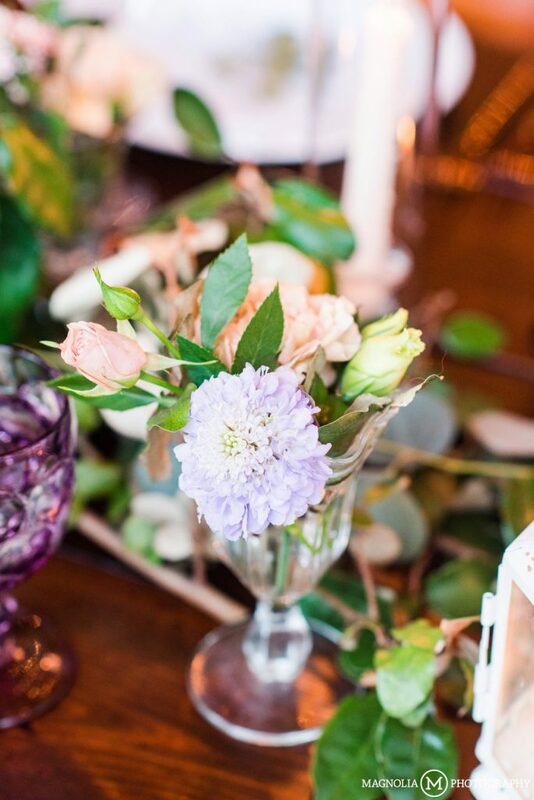 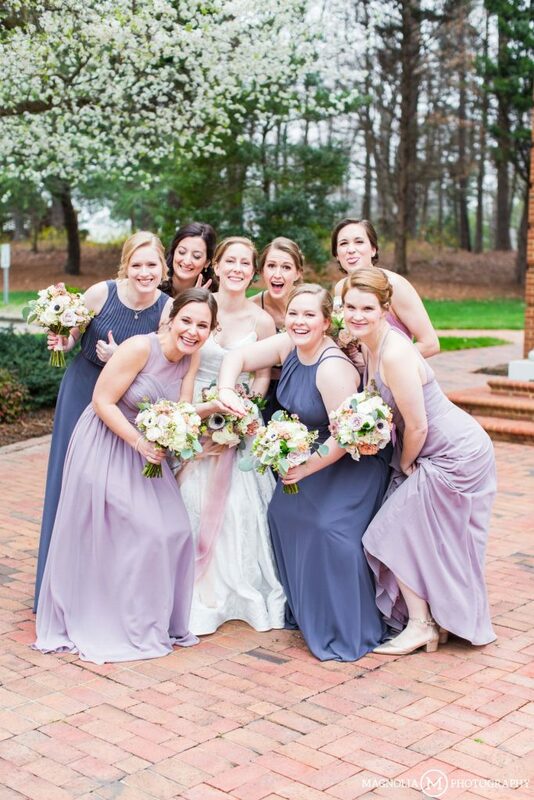 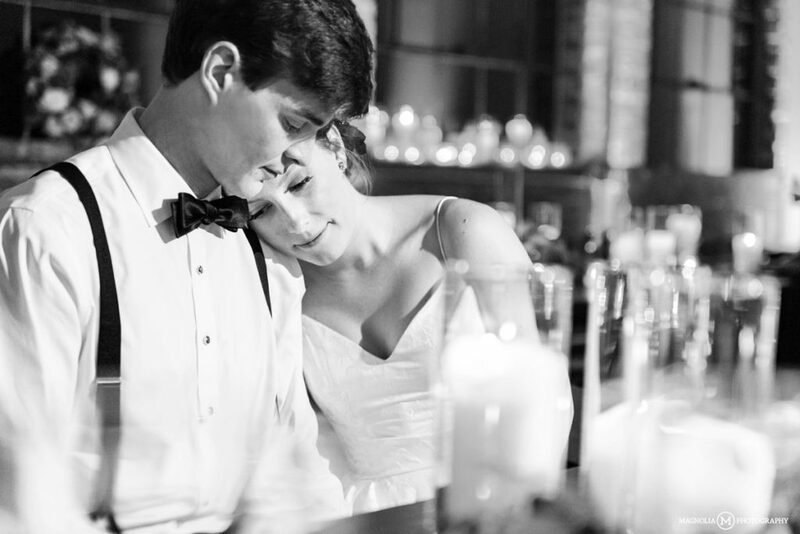 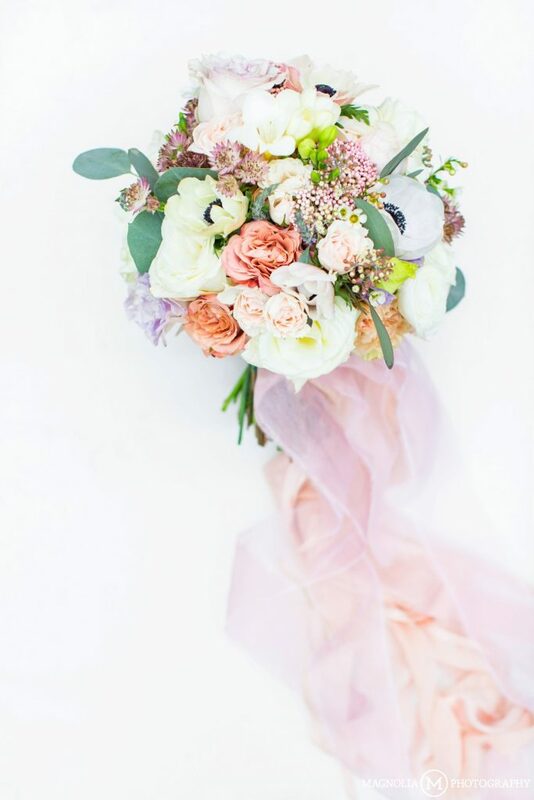 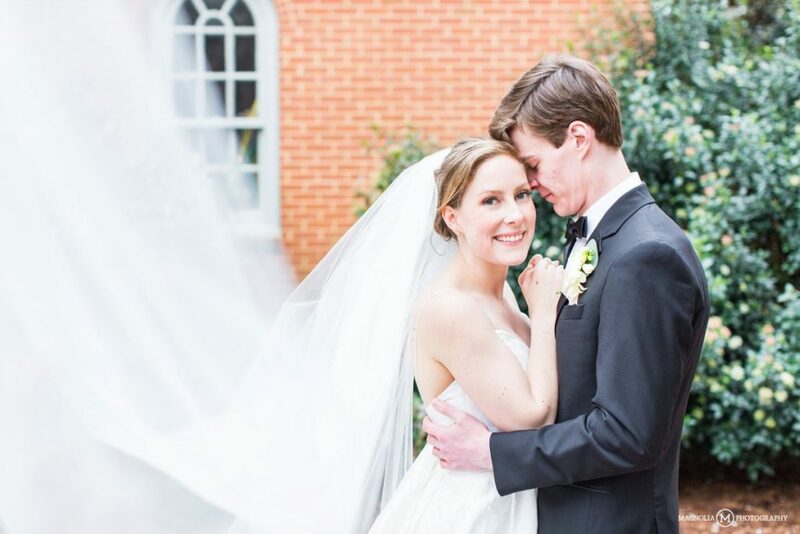 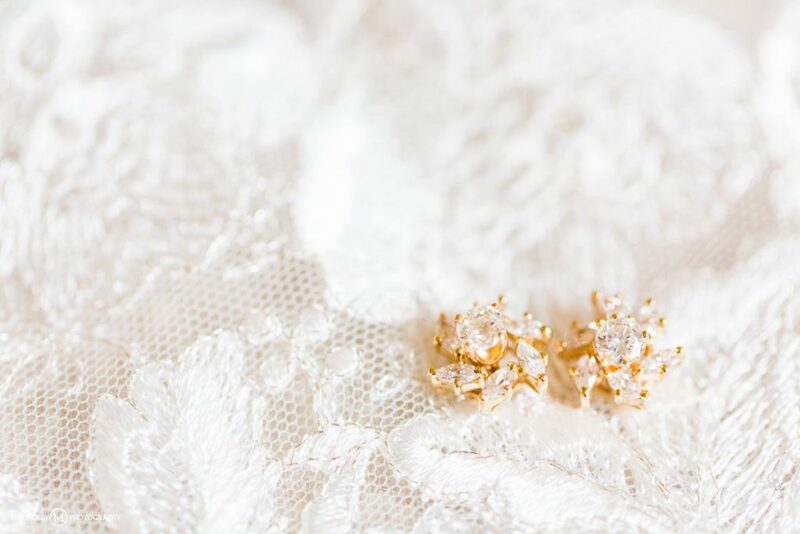 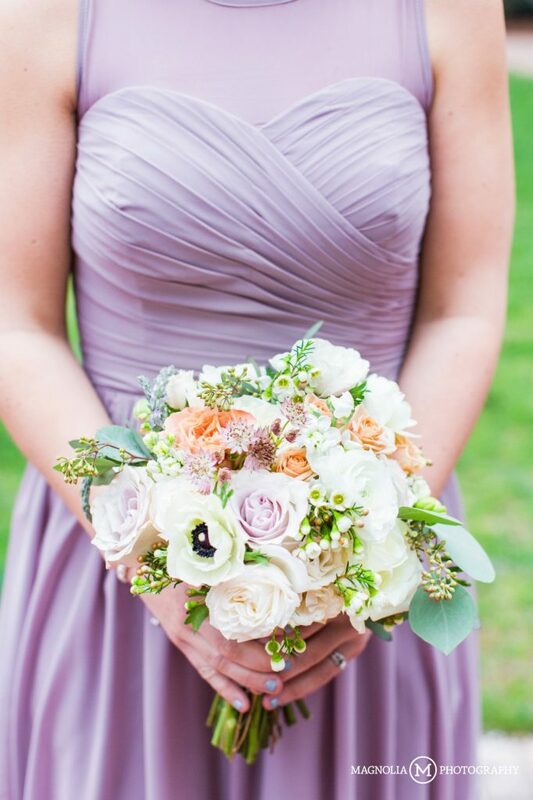 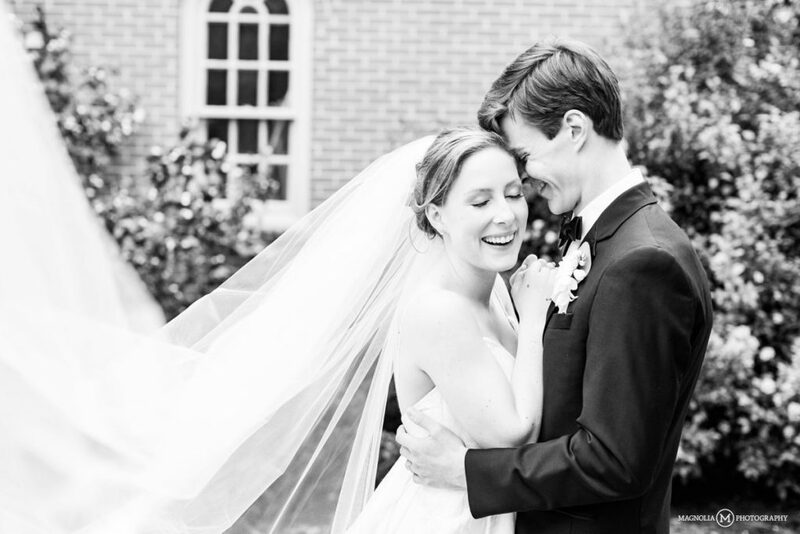 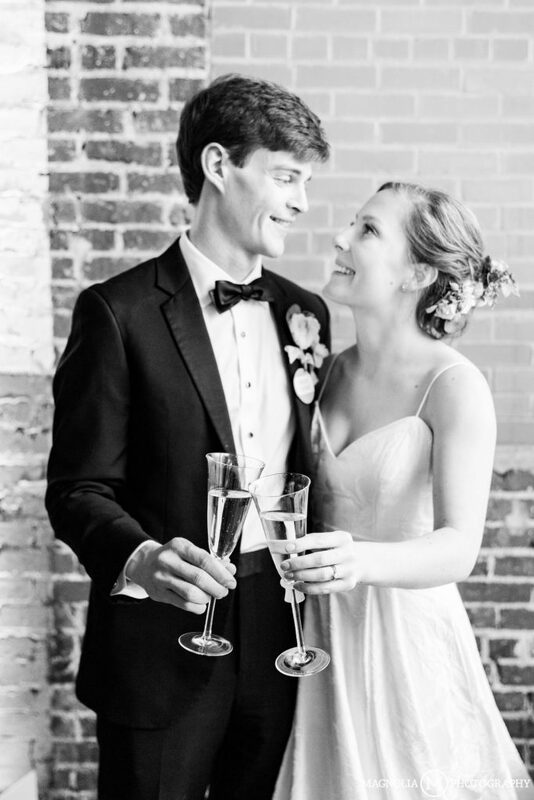 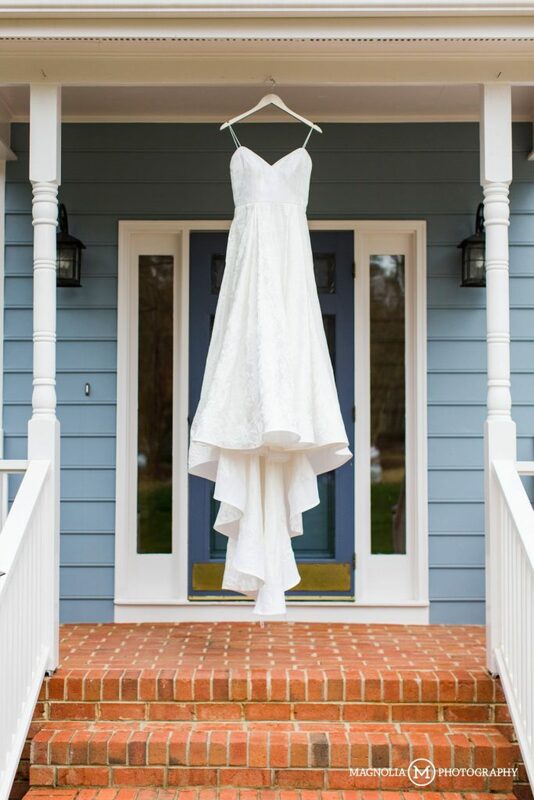 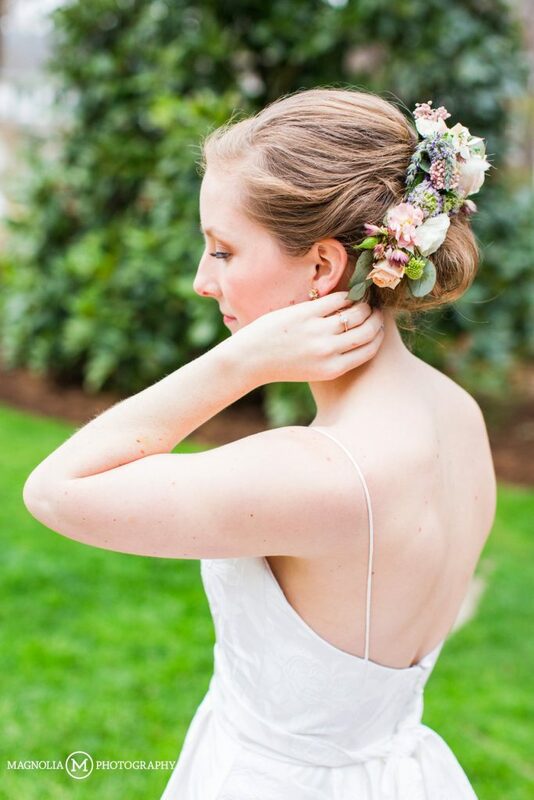 Comments Off on Forest Hall at Chatham Mills Wedding | Kristin + Glenn Married	:: Add One!